Best Cities In Asia For Shopping – While I have seriously cut down on all kinds of shopping since I started traveling so much, I have found it very difficult to resist spending all of my money on clothes and shoes while in Asia – the shopping malls and prices in Europe simply can’t compare to those in Asia. The only thing that has stopped me from filling my backpack with shoes and dresses is that I hate the extra weight. I’ve dealt with my shopping-cravings by saying that one day I will go back with at least one large empty suitcase to fill up with all the shopping I want before I leave again. When I do this, these are the places I will visit – which are known to have some of the best shopping in Asia. The first time I went on Malaysia holidays and visited Kuala Lumpur I was completely shocked by the sheer size of the shopping malls. Just like in Bangkok you can walk from one shopping mall to another without ever even going outside. Berjaya Times Square mall is enormous, and you will find that a lot of tourists inside are carrying maps of the mall as it’s so easy to get lost. For more luxurious shopping Kuala Lumpur CC mall underneath the famous Petronas Towers is the place to go, a place where I found myself surrounded by cat walk models on a shopping spree – this mall is worth a visit just to see the towers themselves. 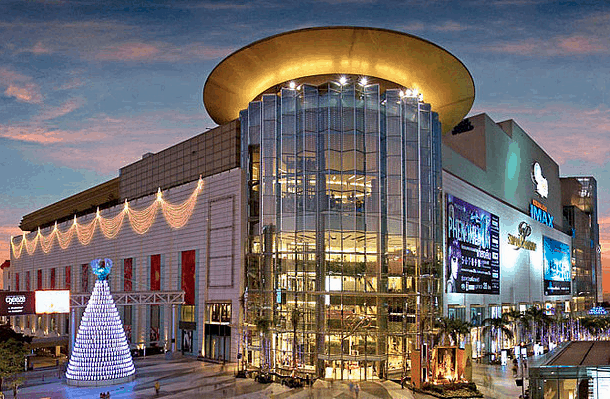 The most famous malls are Bukit Bintang Plaza, Low Yatm Sungeu Wang Plaza and Starhill Plaza. There are also a lot of interesting night markets around town where you can do some more budget retail shopping, like Petaling Street in China town. Bangkok is a shoppers haven, offering everything on earth for some amazing prices, even compared to other cities in Thailand. From Thai silk and handicrafts, budget rip-offs to high end fashion, local designers to international brands, everything is right here in Bangkok, and often under the same roof. We experienced some amazing service from the shops, one which actually sent a microphone we bought via express flight up to Chiang Mai half an hour after we bought it online, and we received it the same evening. Top places to shop are Central World Plaza (biggest mall in Bangkok), Chatuchak Market, Paptong Night Market, MBK Mall, Siam Discovery, Pantip Plaza, Siam Paragon among others. Shopping in Hong Kong China is more than just a social activity, it is treated more like a serious sport, and it’s an important part of their history, culture and way of life. Hong Kong is smaller than Bangkok which makes it a lot easier getting around, something which is crucial when you are out to simply shop. The best time to go for Hong Kong holidays is either in July to September or late December to February when the city has some truly amazing sales. The most popular places to shop are Festival Walk, SOHO, Causeway Bay and Kowloon. Whether you’re lucky enough to get a layover on international Hong Kong flights or are planning a holiday to Hong Kong, you must take time to experience some of the greatest shopping in the world. Like many other Asian countries, Hong Kong has a reputation for covering all aspects of the shopping spectrum; you’ll be able to find everything from one of a kind jewelry pieces to the latest and greatest in gadgets. Don’t worry if you don’t have the cash to splash, as you can usually stick for your budget in Hong Kong and still find exactly what you’re looking for. 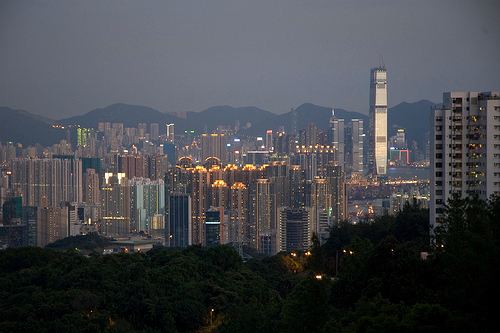 From street markets to upscale department stores, Hong Kong has it all. If this has already got you searching the internet for a flight to Hong Kong, don’t delay – experience the magic of this vibrant city and start your shopping adventure today! If you’re looking for a bargain, you can’t go past the Temple Street Night Market in Kowloon. The markets are open daily, from 4pm to midnight, providing you with plenty of time to find just what you need! You’ll find something for everyone at these markets, with a variety of clothing, gadgets, watches, electronics, luggage and various food stalls. If you want to buy some souvenirs for the unlucky non-travelers back home, the Temple Street Night Market is the perfect place. As far as shopping malls are concerned, this is the crème de le crème of Hong Kong. The Plaza Hollywood Shopping Mall is one of the largest in the East of Hong Kong, located among the infamous Kowloon Shopping District. There are more than 220 stores and restaurants, an enormous exhibition center and a cinema located within Plaza Hollywood. If you’re looking to spend a little money on some world famous brands, DFS Galleria is the perfect shopping destination for you. Stocking only the finest international brands globetrotters, from all across the world, travel to Hong Kong to experience the luxurious shopping experience of a lifetime. Also known as the Tung Choi Street Markets, the Ladies’ Markets offer everything a girl could need. While men’s and children’s clothing are on sale, as well as various toys, there is an abundance of women’s clothing, bags and accessories. Most of the clothing found at the markets is quite affordable, making this a popular shopping destination with tourists. Also located in the market district of Kowloon, the Ladies’ market is open every evening from noon until 11.30 pm. This is the place where shopping meets art. Designed to incorporate the wonders of art and nature, this isn’t just shopping; it’s an entire experience. The first of its kind in the world, K11 blends the beauty of the world to create an unforgettable atmosphere, enhanced by intricate architectural detailing. Out of all the things in Asia, the thing I loved the most was to visit the bustling morning markets..! Floating markets, golden palaces and porcelain-laid spires all seem to transport you to a different era and place. Sukhothai has more Buddha statues than you can count. They are all so beautifully carved, and I find the contrasting colors to be amazing. A unique mix of tradition and pop culture. Start your morning on a refreshing note with a walk along the Sumida River’s cherry blossom trees. Take a quick glance at history with the Edo-Tokyo museum or go spend some time in the East Gardens of the Imperial Palace. The overgrown temples and ruins of Angkor Wat, bathed in morning sunlight, truly mesmerize you. The royal city of Angkor Thom is one of the main attractions of Siem Rieo, along with Cambodian Cultural Village and Angkor Night market. The parents of this curious little runner had come up with a genius idea to keep track of where she was all the time – squeaky shoes! Off-Season In South East Asia – Is It Worth It? The city’s hustling, bustling Night Bazaar is one of the many tourist attractions. Equally enchanting, however are the National Museum and Botanic Garden, soaking you in the sweet smell of Thai orchids. The city contains over 30 temples. This little kitten had the best playground of all: a turtle temple with dark little caves surrounded by a fish pond – but it was more curious about the few visitors. Unique features? Floating islands, skyscrapers, traditional Chinese architecture, scrumptious dim sum and the serene hills of Nan Lian Garden. 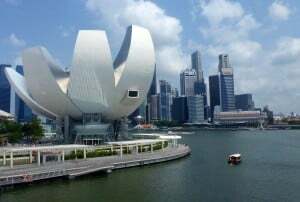 A myriad of tall-standing modern skyscrapers defines Singapore’s city scape. 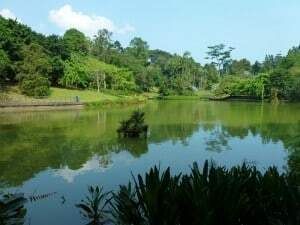 If you are a horticulture lover, you might love Gardens by the Bay and Singapore Botanic Gardens. The observation deck of Sands SkyPark makes you feel truly on the sky. The city’s shrines are a testament to its ancient past. From the 6th century Shimogamo Shrine to the life-sized Thousand Armed Kannon statues of Sanjūsangen-dō, Kyoto offers you a unique walk down its past. Let the iconic island sweep you off your feet with its tranquil beaches and exotic, food and drinks. Experience the underwater world while scuba diving. One of the top spa destinations in Asia, try the famous Balinese massage in the village cluster of Ubud. Reflexology, aromatherapy and acupressure are some of the massage treatments. Also, have a look at the tomb cloisters at Gunung Kawi. This beautiful bunch of flowers are often used as vegetables in South East Asia. They put them in salads, soups and often baguettes. The city is dotted with restaurants offering you cheap but delicious Taiwanese specialties. The cuisines on offer are regional cuisines from China, India, Japan and even Italy. The mystic city of New Delhi fascinates tourists with its 17th century Red Fort, the Chandni Chowk bazaar, Jantar Mantar and the India Gate. The city offers you glimpses into its history as a Southeast Asian trading port, from the 15th-19th centuries. Some attractions are the Quan Cong Temple and the Japanese Covered Bridge. Nicknamed ‘The Pink City’, Jaipur’s streets are lined with glorious stucco buildings. Places to visit include Hawa Mahal, City Palace and Amber and Jaigarh forts. Famous for its sandy coast, Old Goa houses the beautiful Basilica of Bom Jesus, which is a UNESCO World Heritage Site. Rent a junk boat or kayak and explore rock formations, limestone islands and caves sprawled across the Halong Bay. This lady was very careful with her shopping, and looked well and long for the best vegetables in the pile. Ancient temples, archaeological ruins and floating gardens are just the beginning of what you will find in Burma (Myanmar) – a beautiful and enigmatic destination in Southeast Asia. From the modern capital of Yangon to the idyllic waterfront villages on Lake Inle, Burma is rich in cultural diversity and timeless traditions. The markets of Yangon’s old Chinese and colonial quarters are legendary – you can spend the morning haggling and bartering for just about anything. This is the place to find the perfect souvenir to bring back home – just don’t get lost in the old quarter’s warren-like maze of streets. Burma is world famous for it ancient temples and pagodas. In fact, it is said to have the best temple architecture in all of Asia. Spend an afternoon exploring the Sule Pagoda and the Shwedagon Pagoda. The Sule Pagoda is said to date back over 2,000 years, and the Shwedagon is believed to contain more gold than the banks of England, but you will have to find out whether this is fact or fiction..! In Amarapura, one of the ancient cities of Burma, you can take a scenic stroll across the 1.2 km long U Bein Bridge (the longest teak bridge in the world! ), and visit traditional silk and cotton weaving workshops. You can also visit the huge Mahaghandayon Monastery (with over 2000 monks) which is one of the most important monasteries in the country. Inwa is another of Burma’s important ancient cities, with a long history of successive Burmese kingdoms from the 14th to 19th centuries. The city was sacked and rebuilt several times, until it was finally abandoned in 1839 after a series of earthquakes. To get to Inwa you take a short boat trip across the river where you’ll be met by a number of horse carts ready to take you on a tour of the area. Perhaps the most pleasurable way to see Myanmar, feel its pulse and understand its history, is to take a cruise on the Irrawaddy River with Bales. While slowly floating down the river, you will have a chance to see a more traditional and idyllic side of Burma, passing rustic villages and lush landscapes which make you feel like you’ve taken a step back in time. Bagan is Burma’s archeological paradise and is said to have over 2,000 pagodas – from the well-preserved Ananda Temple to the masterful brickwork of the Dhammayan-gyi, this is a magical and fascinating place to visit. Bagan is also known for its handicrafts and traditional lacquer ware, so no trip to Bagan is complete without a stopping at the Nyaung U market to pick up some more exotic souvenirs before heading home. Have you been to Burma? Bamboo Forest Japan A Place Worth Visiting! Bamboo Forest Japan – Planning to visit Kyoto? If so, the Bamboo Forest Japan is a must stop. It may be that you have not planned your trip yet, but you can definitely bring your travel experience to a new dimension (climbing Mount Fuji) if you plan for it wisely. You can see the bamboo forest situated in Arashiyama’s small town. This indicates that it is just twenty-five minutes away from the downtown Kyoto. So, if you plan to visit Tokyo, all you need to do is to catch a high-speed train, and take a short ride to Kyoto. In two hours or so, you will see yourself in the enchanting Bamboo forest Japan. Once you are there, your journey begins! 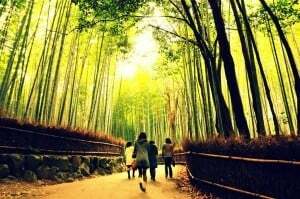 Here is the essential information you should have while traveling around the Bamboo forest Japan. Though the scenery of bamboos planted all around the forest is amazing, there still is something you should consider seriously, i.e. the weather. Just because the weather of Kyoto is quite unpredictable, you should be well aware that it can rain anytime. However, the good thing is that you do not have to see a crowd of tourists while you enjoy traveling. Now that you have learned about the weather, you are required to pack smartly. If you are visiting Bamboo Forest Japan for the first time, then you will surely be amazed to see how tall those bamboos are! In simple words, the site seems peaceful and majestic. 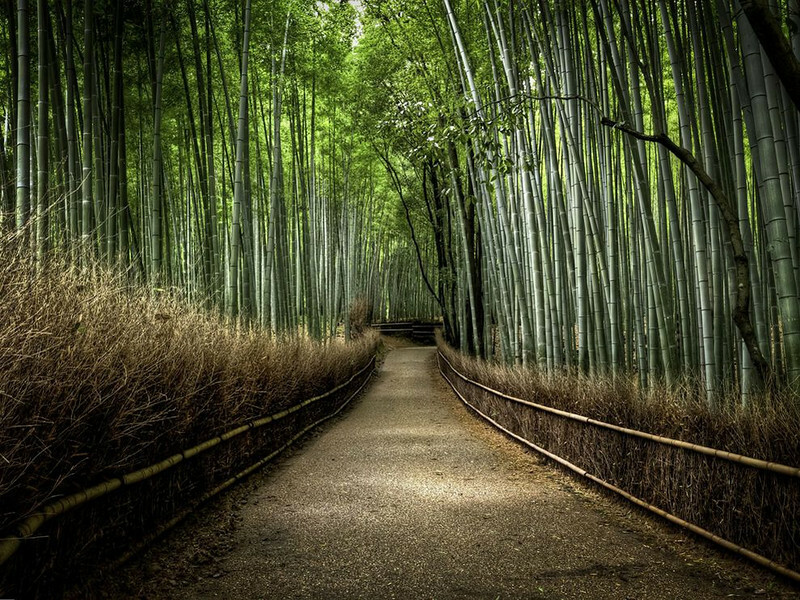 Walking through the paths is another way to enjoy the tremendous sight of bamboos planted all around you. And yes, these paths have been paved. One of the best places to visit is Seisyuuan. Along with offering the beautiful view of a river, you can explore where the oldest bridge of the town is. While you roam around Arashiyama, do not forget to eat boiled tofu. 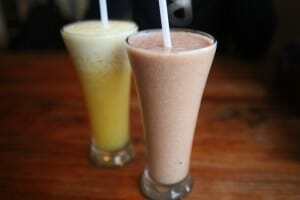 As one of the specialties of this place, you can try it with a combination of meal. 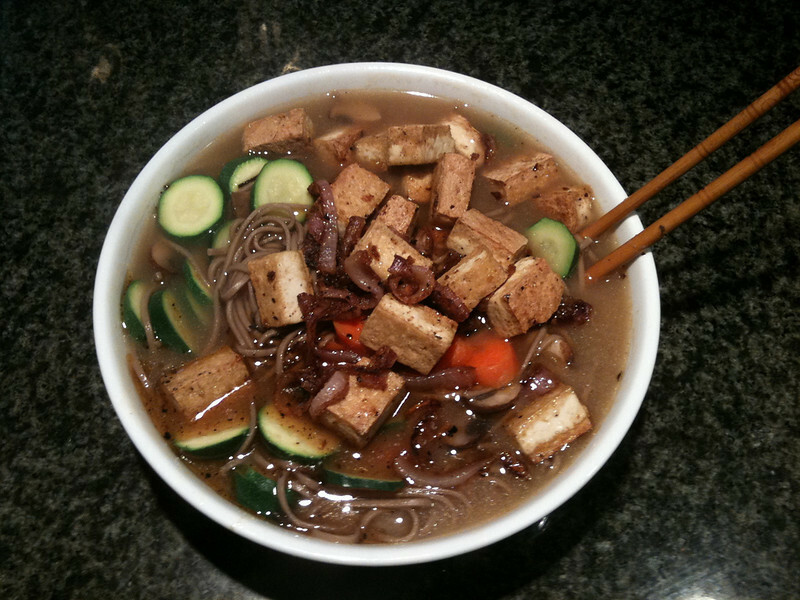 Usually, something worth noticing is the boiling water pot filled with delicious tofu brought on your dining table. Though this is considered the simplest meal you can have after enjoying the sights of Bamboo Forest Japan, many tourists find it equally delicious. The best way to end your day is to look for a warm foot bath. So, when you have walked a lot on the paths of Bamboo Forest Japan this foot bath will help you say good-bye to the foot pain, fatigue, and stress. You can find them all over the world, and though there might be a few differences, the riding them is familiar in a comfortable, second-nature way. Plus, they’re a great way to see places a bit faster than walking, and they offer a good compromise between speed and green sustainability. So when my friend Andrew sent me a message from Japan inviting me on an epic, South to North bike tour of the 4 main islands, I really wanted to say yes, and then work out the money and timing after. Fast-forward five months, after a bit of work getting funds and time together, I am in Japan with Andrew, and we’re about to set out. We managed to lure another brave soul with the promise of adventure and Japanese sake, Scott, so it will be the three of us with our bikes and our panniers, taking on Japan. The first and biggest challenge we faced, when we all committed to the trip, was coordination. This trip has been planned, almost completely, with the three of us living in different countries. Andrew has been in Japan for the last 2 years, teaching English, Scott lives in Boston, and I was in Montreal. This meant our trip was planned mostly through a hodgepodge of email and Skype and even an attempt at a Google Wave. Another kink came up in time zones. Andrew was 13 hours ahead of Scott and I, making his 5pm our 4am. To make matters worse, I was working nights and Scott was working days. This meant that, whenever the three of us were chatting or talking in real-time, one or more of us was only half-conscious. Somehow, we all managed to get to Japan safe and sound, although not without some trouble (and some more trouble and as I write this, we are about 6 hours away from setting out on our pre-trip, 3-day hike on a little island near our start point, called Yakushima. As for the route we’ll take, much of it will be decided on the road, but the two fixed points are the southernmost and northernmost points of Japan’s main four islands, Cape Sata in the south and Cape Soya in the far north. However, recent events in Japan have made us reconsider some of the bits in the middle. So far, our plan is to keep abreast of the latest news, and make final decisions as we approach them, perhaps taking a train or ferry to avoid any danger. Recent events also made us reconsider our own motivations for taking the trip, and what bike-touring Japan right now would mean. We decided that, while we didn’t want to just cancel the trip and ignore the devastation, we could not simply go on as if nothing had happened. Instead, we decided to turn our trip into something to benefit Japan’s needy, in whatever small way we could. To that end, we have begun a donation campaign for Red Cross and Samaritan’s Purse, using our trip as a motivation for others to give. Our goal is to raise $1 per kilometer per person, and since we should each be riding at least 3400km, we have set the bar at $10,000. I am happy to say that we are almost pennies away from halfway, and considering we haven’t even started yet, that is amazing. I am even more excited about the idea that we could exceed that goal. If you have thought about giving to relief in Japan, we encourage you to take the plunge and give. Especially in autumn, Komyozenji Temple in Dazaifu, Japan is the epitome of refined, quiet beauty. Sitting in the calm environment of the zen garden behind the temple always invites introspection. In the same spirit as the Springtime cherry blossom viewings that are popular in Japan, people flock to temples, shrines, parks, and gardens such as Komyozenji to enjoy the changing and falling leaves of Autumn. Photographs taken by travel photographer Andrew Marston who currently lives in Japan and runs a daily travel photography blog where other photographs from this trip will also be posted over the course of the coming weeks. The inviting subtropical climate of Kyushu Island was driving me crazy! With hot summers and mild winters, I needed to escape this “paradise”. I grew up in frosty Maine, USA! We’re talking a place where November to April freezes your bones and makes even the toughest woodsman don an extra layer of flannel. After some research, the Japanese Alps in the heart of winter sounded just the snowy get-away I pined for. After one of the most enchanting train trips I’ve ever taken, I arrived in Takayama. From there, it was a short bus ride through the switch backs of the Hida Mountains to Shirakawa Village. Well deserving of its designation as a UNESCO World Heritage site, this village prides itself on being a time warp back to Edo period traditional Japan, complete with farm houses built with thatching. It also happens to be one of the snowiest places in Japan (measured in annual snowfall) and certainly lived up to the title. Lori, my fiance, and I spent about 4 hours walking around snapping photos and soaking up the handsome historical vibes before it was time to take the bus back. If ever you visit Shirakwa Village, I highly recommend walking up the path behind Wada house to Shiroyama Viewpoint (the last picture shown was taken from there). Don’t forget your hand warmers and camera either. For more of my escape to Winter in Traditional Japan, the trip starts here. Andrew Marston is a Japan based travel photographer. 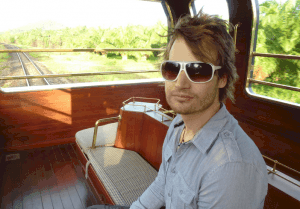 He likes slow train rides through rural areas, cameras with lots of buttons, and sharing his adventures with others. Mount Kilimanjaro is probably one of the most famous mountains in the world – it’s the highest walk-able peak anywhere on the planet and thousands of people head here each year to climb it. That’s all well and good, but if you’ll be climbing Kilimanjaro as part of your gap year, you should know a bit more than that – to get you started, here are a few things you might not know about the Tanzanian mountain. In October 1889, Hans Meyer, Ludwig Purtscheller and Yoanas Kinyala Lauwo became the first people to officially reach the rim of the Kibo crater and were the first ones to ascend Uhuru Peak – the highest point – on Purtscheller’s 40th birthday. This was actually Meyer’s third attempt at scaling the mountain and the expedition party – which also included nine porters, a guide, a cook and two local headmen – set out from Mombasa on foot – imagine walking nearly 300 km before you even started your climb! Despite being called Mount Kilimanjaro; it is, in fact, a stratavolcano, which is comprised of three volcanic cones, the highest of which is the Kibo crater where you’ll find Uhuru Peak. Kibo is a dormant volcano, while the other two craters – Mawenzi and Shira – are extinct. You’ll no doubt know there are six official routes to the summit, but are you aware that only one of these follows the same path down? Well, the Marangu route is one to avoid if you want to have a bit more variety on your trek, as you’ll go back down the way you came up if you choose this trail! It’s also one of the busiest paths, so look elsewhere if you want a bit of solitude on your climb. Four of the other tracks – Machame, Shira, Lemosho and Umbwe – all share the same descent, known as the Mweka route. It’s only ever used for going down, so you’ll never meet travelers on their way up on the final days of your trek. There’s a wooden box stored at the top of Uhuru Peak where almost every traveler to have made the climb has written down their feelings about the trek. Have you climbed Mt Kilimanjaro? Most people climb Mount Fuji from the “5th Station” which is located about 2300 meters in altitude. However, every year a very small percentage of the 300,000 annual Fuji hikers decide that they must hike all of the mountain and start from 0m in elevation at the ocean. I had never heard of this route, nor have most Japanese people, but as soon as I learned it was an option, I knew I had to try. 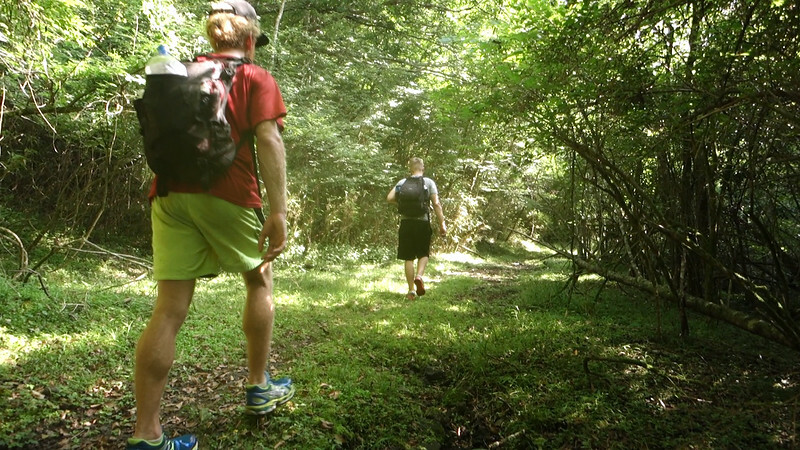 When my ultra-fitness friend Andy came to visit Japan, it was the perfect chance. And so, at 11PM on Friday night, Andy and I, together with our friend Axel, went to Tagonoura Beach with no idea what we had gotten ourselves into. Our plan was to hike the entire day. We reached the summit of Fuji to see the sunrise. Our plan after that was to somehow walk down the other side to a bus that would take us to a hotel. Per tradition when climbing Mount Fuji sea to summit, we filled our water bottles with sea water before heading out so we could dump them out at the top. In the process, Axel managed to completely soak both of his sneakers meaning every step of his hike would be slightly less comfortable. This wasn’t a good omen for the beginning of our trek. We followed a route map created by another sea to summit hiker from which started us out walking on town roads. At 2 AM, we reached our final opportunity to stock up on supplies until reaching the 5th station, 7-11. Past this convenience store we would be dipping into the woods for another 10 hours. Needless to say, we bought all the chocolate bars our packs could hold. At noon, we came out of the forest into a big parking lot. We had arrived at Mizugazuka Park. This marked the halfway point of our journey. Thirteen hours down, and only halfway… we were a bit behind schedule. Hopefully we wouldn’t be too late to catch the sunrise. There were picnic tables under an awning and a gift shop. While we sat there munching happily on our chocolate bars, we heard a distinct and far-off sound that caught our attention. Somewhere off in the distance thunder boomed ominously. Ten minutes later we were in the middle of a heavy downpour. Thankfully, under the protection of the snack shop’s awning, we ended up waiting an hour before the rain let up. Hopefully it hadn’t made trails too muddy or slick. The afternoon turned to dusk as we hiked through the enchanted forest trails of Gotenniwa Nature Park. Finally, we left the tree line behind and arrived at the 5th Station of the Fujinomiya Trail. This is where most people start their Fuji hike, but we had already been walking for about 20 hours. With spirits low and motivation waning, we bought more chocolate bars at the 5th Station Lodge and ate a very welcome instant noodle dinner. By this point it was now dark, and at this altitude the temperature had dropped to around 12 degrees Celsius. After changing into our cold weather gear and saying several desperate prayers for strength, we set out to climb Mt. Fuji like everyone else. Ours was a typical Fuji night hike experience, if not slightly slower. We would step uphill in the dark for about an hour until we reached one of the many mountain huts where we would take a break and eat more chocolate. However, things got really difficult around 3000 meters in elevation. It was midnight and Andy was complaining of a headache, nausea, and dizziness, all classic signs of altitude sickness. All our energy levels were dangerously low having not slept since the morning of the previous day. Despite our winter jackets, the now 4 degree (Celsius) temperature meant that if we stopped walking for long we would start shaking involuntarily. Most of the final push for the summit is a blur, but I know somehow we made it up the final stretch to the peak. 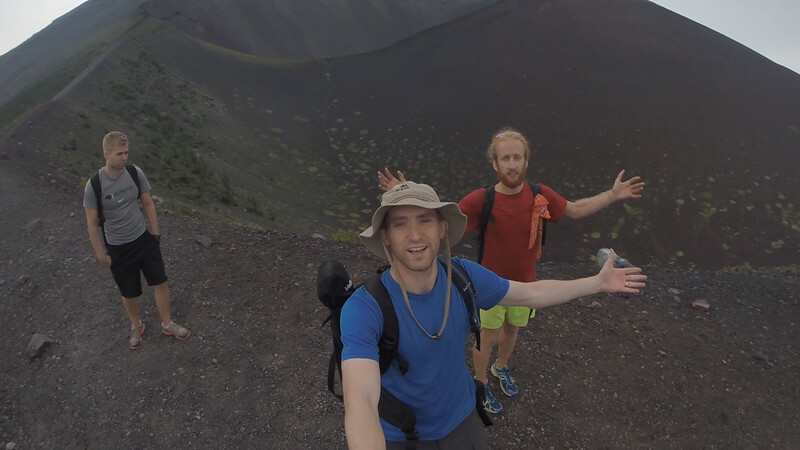 After 27 hours of hiking over 50 kilometers up 3776 meters in elevation, we had done it. Dumping out my water bottle full of undrinkable sea water at the peak, I felt a slight sense of accomplishment mixed with an overwhelming desire to go to bed. I can easily say it was the most physically demanding 27 hours of my life. I would definitely recommend others considering climbing Mount Fuji to train beforehand, hike with friends, and bring a backpack full of chocolate bars and warm clothes. Andrew Marston is a graphic designer and wannabe YouTuber living in Nagoya, Japan with his wife and several house plants. Hoi An Vietnam ~ If you’ve been travelling through Vietnam for a while, arriving in Hoi An is like a breath of fresh air – this little city located smack dab in the middle of the country is the kind of place that feels like a town frozen in time. Much of Hoi An’s charm lies in its colorful colonial streets and historic buildings that date hundreds of years back to a time when the port city was still known as Faifo. History oozes from the city’s walls and it’s easy to spend hours wandering around as you soak it all in. One of the more unique buildings found in Hoi An is the Japanese Covered Bridge located in the historic town center. The Japanese bridge was built by the Japanese community in the early 1600’s and it still stands today. When you cross this bridge you’ll notice that one side of the entrance is guarded by two monkey statues while the other is guarded by two dogs. It is believed that this is because construction began in the year of the monkey and finished in the year of the dog, but the truth is that it happened so long ago that no one can say for sure. If you are interested in doing a lot of sightseeing in Hoi An, a good option might be to purchase special tourist ticket from the local information office in the center of town. For $6 you’ll have access to any 5 museums, temples, assembly halls, traditional performances and workshops. 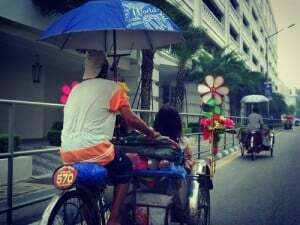 The best way to explore the city center is to rent a bicycle for the length of your stay – get lost in the back alleys, cycle the length of the riverfront, and then cross over to An Hoi Island which hosts a fun night market in the evenings. Another nice aspect about renting a bicycle is that you can take a few side trips to places like Tra Que (an organic herb village about 2 kilometers north of the city), or if you are craving some time at the beach, you can take your pick from An Bang beach or Cua Dai beach which are also a short bike ride away. The first thing you’ll notice when you arrive in Hoi An are the beautiful silk lanterns adorning the buildings across town. 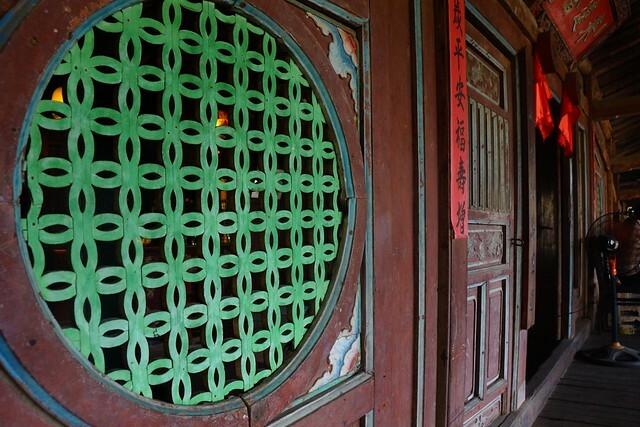 Their bright colors and patterns brighten up the streets while helping preserve some of the old world charm. 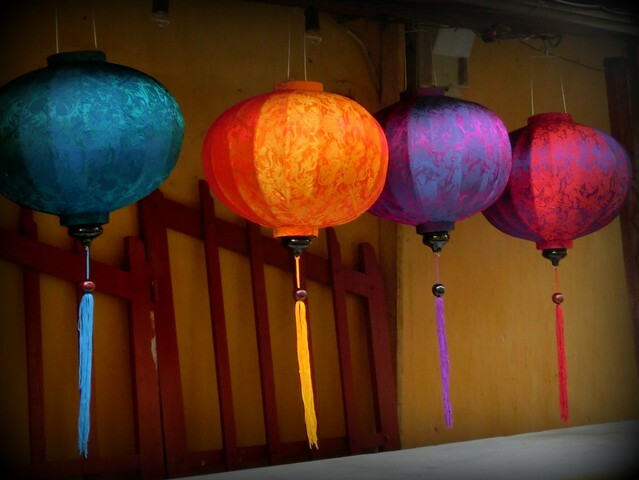 For those interested in taking some silk lanterns back home as souvenirs, there is the option of attending a lantern-making workshop in town, or if you’re not too crafty, you can purchase them from any of the gift shops. 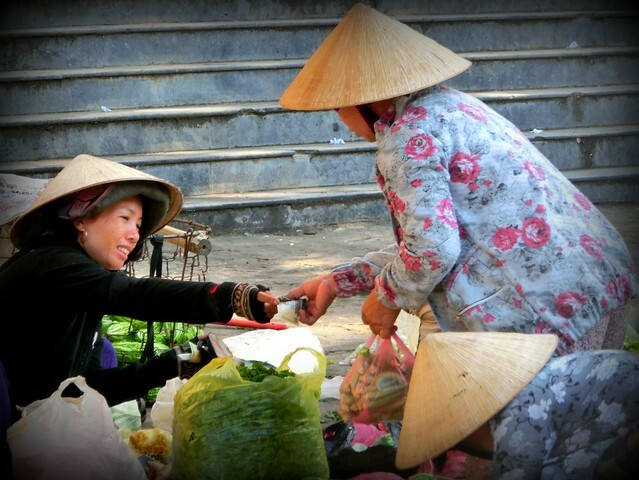 Hoi An’s markets get going early in the day. If you arrive at the Central Market shortly after sunrise, you’ll find vendors setting up along the waterfront by the Thu Bon River. The market is a blur of fresh fruits and vegetables, live chickens and ducks, nuts and spices, and so much more. The Central Market can get really busy by mid-morning, so expect to compete for walking space with motorbikes, bicycles, shoppers, and vendors swinging yokes full of produce. 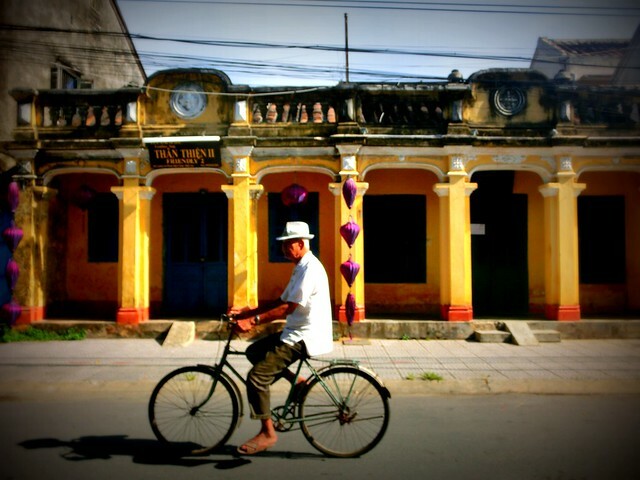 Hoi An is a city for shopping. If you want to have clothes custom made for a fraction of the price you would pay back at home, then this is the place for you. There are hundreds of tailor shops in Hoi An, so don’t be too quick to settle on one. Browse the mannequins around town, flip through the catalogs in each shop, and if you still can’t find what you want, bring in a magazine or a sketch, and tailors will work with you. 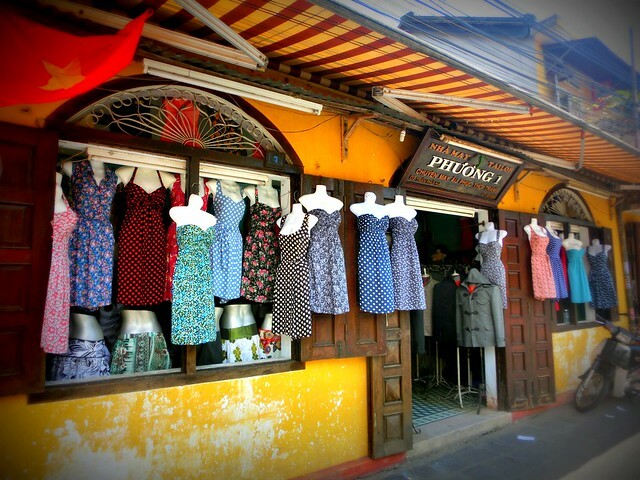 Whether you’re looking for summer dresses, leather sandals, or a three-piece suit, you can have it made in Hoi An. That’s Hoi An in a nutshell. If you’re considering travelling through Vietnam, this little city should be one of the top spots on your itinerary! Vietnam is a country with a long history and a fascinating culture. Just the fact that there are as many as 1000 historical, cultural, and architectural sites which have been officially classified as “Heritage Sites” is reason alone to consider traveling to Vietnam. In Hue, you can pass through the Thahn Tan Hot Springs on the way to the picturesque Thuan An Beach. 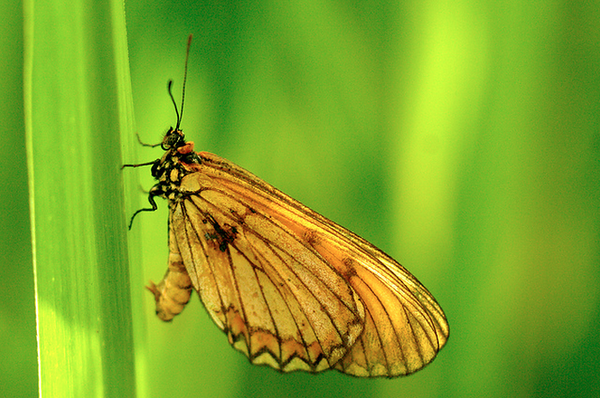 They are around 13 kilometers from Hue itself and surrounded by woodland. The idea is that you start off in the coolest waters and work your way up to the hottest. You could also explore the Dai Noi (Imperial Citadel) which is almost like a historical monument in its own right. In fact, the peaceful surrounds of this unique walled complex is absolutely unmissable and well worth a day of your time to explore. Take a boat cruise down the Perfume River to see the seven Tombs of the Emperors – the lavish tombs of Vietnam’s last imperial family. These elaborate resting places date from the late 19th or early 20th centuries and one of the most ornate both inside and out is the 1925 tomb of Khai Dinh. 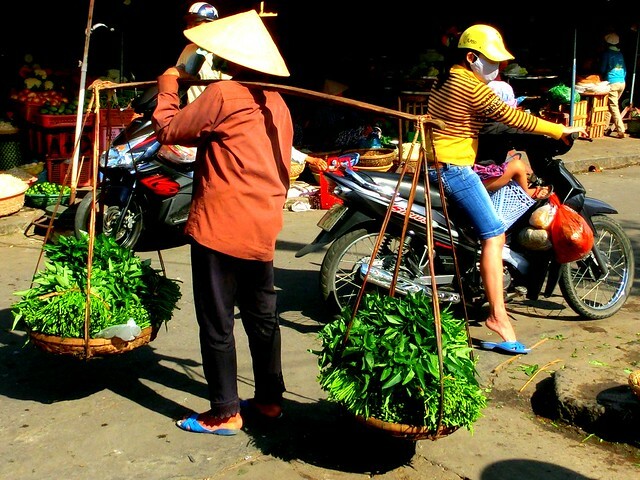 It’s no surprise that pretty Hoi An is one of Vietnam’s most popular destinations. It’s got a little bit of everything – fascinating history, great food, unparalleled shopping, top notch hotels and a beautiful beach to boot. Make it here for the Full Moon and you’ll see the locals celebrate by switching off all its electrical lighting and making the town look beautiful by the light of thousands of lanterns. If it’s relaxation you’re seeking, then check out the Zen Spa where you will receive traditional Vietnamese therapies. Many of the hotels and resorts in Hoi An town, by the beach have some fantastic facilities. The five star Fusion Maia, located between Hoi An and Da Nang is Asia’s first all-inclusive spa hotel, with the biggest spa complex in the region – definitely the best place to indulge yourself. To get out and about, a lot of visitors hire bicycles or motorbikes in town and then cycle around the center and the surrounding area to really get down with the locals. From the beach, take a boat out to Cham Island for amazing snorkeling and diving opportunities, wandering through traditional rice paddies and explore archaeological sites. Halfway between Hoi An and Da Nang are the romantically-named Marble Mountains. A day trip into this area will reveal hidden cave entrances, numerous tunnels, and several Buddhist sanctuaries. Those with energy to burn can climb up one of the peaks for a stunning panorama. Da Nang and the coastline of the South China Sea have some of Vietnam’s most idyllic beaches. In the town itself, visitors can discover the world’s finest collection of Cham sculpture at the Cham Museum and families can keep the kids happy the wet and wild Da Nang Water Park. Bewitchingly beautiful and exotic, Vietnam’s Halong Bay lying in the Gulf of Tonkin offers a breathtaking variety of natural attractions, historical sites, scenic beaches and nearly 2000 islets and limestone karsts (landscapes recognizable by caves, sinkholes and drainage systems existing under the ground). One of the more popular UNESCO World Heritage sites, Halong Bay is visited by travelers from all over the world each year who come to view enchanting grottoes sculpted by waves and winds, explore illuminated caves and hike in Cat Ba National Park. From Europe you can easily fly to Vietnam from Heathrow Airport or Gatwick Airport; both of UK’s largest airports. If you’re driving to Gatwick Airport make sure you explore official Gatwick Parking options for a great deal. The name “Halong” literally means “Bay of the Descending Dragon” and originates from a legend that attributes the creation of Halong Bay to a great dragon that inhabited the mountains and dug out the crevasses, caves and valleys forming the bay with its enormous tail. When the dragon finally died and fell into the sea, his body was so heavy that water rapidly immersed the area and left only island pinnacles visible. Archaeological evidence indicates that prehistoric humans lived in Halong Bay approximately 20,000 years ago. Currently, 1600 people reside in several separate fishing villages spread over this luscious northern Vietnam area. Inhabiting unique floating houses, the people of Ha Long Bay sustain themselves by fishing and harvesting various marine animals (primarily molluscs) that live in the waters surrounding their villages. The UNESCO World Heritage site’s climate is the most appealing in March, April, May and June, with warm, tropical winds, dazzling sunsets and calm weather conditions dominating the bay during these months. Winter brings cooler temperatures, drizzle and heavy fog to Ha Long Bay while June, July and August is filled with stormy, rainy days and occasionally severe weather events. The most visited Ha Long Bay island is called Cat Ba, famous for its pristine national parks, impressive cave systems and for being home to the Golden-headed langur, an endangered primate that can be found sleeping in caves and foraging during the day. In addition, Cat Ba Island offers swimming, colorful coral reef diving and grottoes. 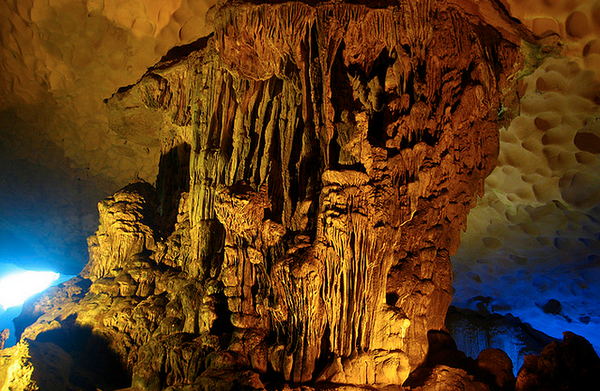 Bo Hon Island attracts travelers who want to see the Virgin Cave, or “Hang Trinh Nu”, where a fascinating shrine has existed inside the cave for hundreds of years. 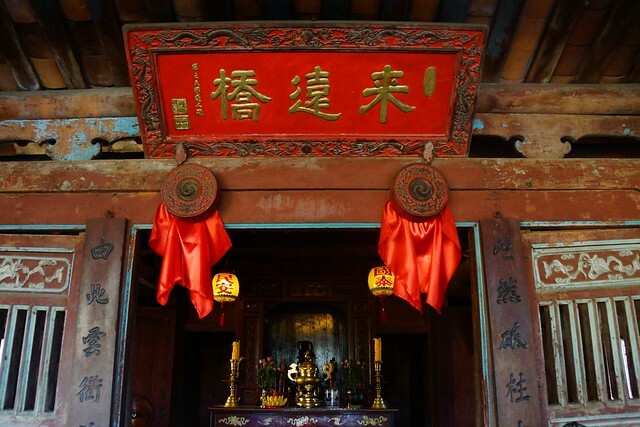 According to legend, this shrine is actually the body of a young woman who committed suicide when she was forced into an arranged marriage with a Chinese man. After taking her own life, her body turned into the stone shrine that is still seen today. Halong Bay is referred to as one of the seven wonders of the world and for good reason. Visitors have access to one of the most resplendent systems of caves that were established during the Pleistocene era between three and 11 thousand years ago. Most of these caves are beautifully illuminated by iridescent lights which intensifies the grandness of ancient stalactites descending from cave ceilings. In addition to the natural beauty of Halong Bay, you can also enjoy the cuisine and culture coloring this lush area of north Vietnam. Gat Gu (steamed rice pancake), sweet-tasting Tien yen chicken and chopped squid grilled to perfection! Laos was a crazy few weeks – we explored some amazing ethnic villages up in Luang Nam Tha. Held on for dear life during over 30 hours of crazy bus trips up and down the steep mountains in northern Laos. BUT worst of all was the fact that we lost over 400 gig and 2 months worth of film. This was really hard to deal with, so we didn’t film for about a week while in Laos. Once we arrived down south in Pakse we started filming again, and this episode is about our adventures down in Southern Laos. Many of the children in Laos were shy but very curious about tourists. And we couldn’t get our eyes off them either, they are just so cute! We spent about a month in Laos, traveling from the northern most part of the country in Luang Nam Tha all the way down to the 4000 islands in the south. Just like the roads in Laos, our trip was an emotional roller coaster of ups and downs, but even though we have had a lot of unfortunate situations, Laos as a country was an amazing place to visit. The Laos People…Laos people are genuine. The kids are the cutest we have ever seen and the adults are very friendly. The small conversations or smiles exchanged are the most precious things we will take away with us from this place. The children were so curious, you couldn’t walk ten meters without someone saying hello, child or adult, especially in the smaller more remote villages. Even though we stayed in shabby guesthouses we left loving the place because of its owners. It’s not the land of smiles, but the people are SO real, they don’t put up an act for tourists at all but were genuine. … are not meant to fit tall people. After every bus ride it felt like we had shrunken a foot by just trying to squeeze our legs into the tiny gaps between the seats, and the beds in the night buses were half our length! Of course we can understand this as there are no Lao people our height, but it was always a mission trying to survive those bumpy crazy bus rides. The view from the bus window is strikingly beautiful and you’ll pass tribe villages along the way, but remember to drop your jaw behind a closed window! For some reason the bus drivers seemed to prefer having all the windows open (even in air con vans), so bring a scarf to cover your mouth with because the roads are very dusty and you can get really sick from getting too much dust in your lungs (Sofia did…). … is something that we have mixed experiences about, but mainly it was all very good. We had the best Indian curries ever in this country, and unlike Thailand – the Indian food here is really cheap, but the Lao food didn’t impress us too much, perhaps because we are vegetarian. However, the French-inspired cuisine was really good. the baguettes and burgers were filled with typical Lao vegetables and Lao style omelette’s (you have to try the pumpkin burgers!). In Vientiane, the capital city, there are a lot of western bakeries selling some of the best pastries and cakes we tried while in South East Asia, for a great price as well. … Lao coffee was the best coffee We have ever had, anywhere. Even without the condensed milk (how will we be able to live without it?) it was still sweet enough for a non-coffee drinker like us to finish in minutes. The best coffee was found in the southern Laos, close to the coffee plantations. Oh, and if you’re looking for the best banana fruit shake in SEA you will find it in the restaurant next to the Reggae bar on Don Det, it’s simply the best! …is a struggle to find. To be brief and blunt, we’d go as far as saying that there is no such thing as comfort here. This is something you have to expect and accept when in Laos. Laos is not Malaysia or Thailand, Laos is Laos and the roads are full of crater like holes, the Wi-Fi is still non existent and the tourism is still pretty new. Never ending steep hills, winding dark red dirt roads, flowing rivers and rice fields. The absolute best scenery we found was in the northern regions around Luang Namtha. Vang Vieng had some incredible nature, with the steep limestone cliffs dipping its feet in the flowing river. The 4000 islands was also a lushious place, one of those where you just lie in a hammock taking the views in for hours on end, watching the Mekond water change color throughout the day. … is for us quite fascinating. In Laos, the concept of “same same” is more obvious than anywhere else. Reclined seat and air con, or plastic chair in the aisle and open windows? Cold water hose 50 meters away from the room or hot shower in attached bathroom? We loved it in a way, it shows how things don’t have to be complicated. This boy in a tribe village in Laos was collecting rocks in his t-shirt. Photo was taken in a rural village in Laos where I was amazed to find five year old children smoking huge tobacco pipes, and half finished coffins under every house. This sweet girl was helping her mother selling snacks at the morning market. I found the Lao people to be the most fascinating part of traveling through Laos. I was happily surprised to see how rich their culture was and how so many people were still living according to their old traditions. Laos is NOT known as the land of smiles, but the people here are still so special, and very genuine in their own way. Below are 5 things that sum up my experience with the Lao people – and just to make sure, these are not facts but my own perception and experience from spending 3 weeks there. Something I found very refreshing was how much time the men spent at home and with their children. It was a very common sight to see men of all ages carrying around babies on their backs and in their arms, feeding them, hushing them to sleep and just general baby sitting – without the mother in sight. They really took time with their kids and gave them attention, playing with them. They also seemed very interested in other people’s kids, always toddling with the babies when sharing a songtheaw (bus á la tuk tuk style) ride. These little people are just the sweetest! Their doll faces and curious eyes are simply irresistible. I’ve never met so many kids in a country who shyly whisper or loudly yell ‘hello’ to you from the street, river, moped or home. They were so curious, and those who were brave enough – smiled, laughed and said hello to you over and over again until you were out of sight. You cannot help but to smile and say hello back. When I mentioned the things I’ve learnt about Thai people someone asked why I didn’t mention the driving. The Thai people are known for their careless driving, and the streets there were chaos, but at least the bus drivers had some common sense. In Laos – they didn’t. 70 people in a 50 seat bus does not make sense, especially when you’re not using your breaks on the steep, windy mountain roads… Chickens and roosters on the road? Who cares, they had it coming! Feathers were constantly sweeping past our windows … travel around Laos really isn’t for the faint-hearted! This lady sitting in her bamboo hut in Laos waved to us to come closer. The way they wave in Laos is the complete opposite from in Europe, so at first we thought she was waving for us to go away, which was confusing because she had the biggest smile in her face. It turned out that all she wanted was to give us one of her bananas. The people are very gentle and kind in Laos, similar to the Thai people – but different. It’s not the most obvious friendliness and they don’t take you in with open arms, they are more stand-offish. However, if you gain a little bit of trust, you will see that they’re actually very friendly people. They are also, like the Thai people, afraid of confrontations. Sometimes it’s really refreshing, other times it’s really frustrating, especially when you just want to get a straight answer to a question. Their way of dealing with it is usually to laugh it off as a joke – which makes for a pretty funny and confusing situation. You might not get a straight answer, but you always leave with a confused smile on your face. This is something that I find very rare around the world. Usually women and men have their own places in which they work; but in Laos the roles are very mixed. The men and women work together. It’s not uncommon to see men standing in stalls cooking street food and banana pancakes, and women working the street as road workers. Both women and men work on tea and coffee plantations, and they both take care of the family. It seemed as though they did what they were best at, if the man cooked better food, he was the chef, and vice versa. The locals in Don Det were early birds, and already before sunrise the fires were burning by every household. “I’d say from Vientiane and down to the 4000 islands – you can skip it all!”. That was the opinion of a girl we met both in northern Laos and again down in the 4000 islands, and it’s the biggest joke I’ve ever heard. If you don’t step off the highway 13 route, then yes she’s right, there isn’t much to see. But if you just take a day to explore the Bolaven Plateau you’ll realize that there is so much of Laos that you would have missed if you wouldn’t have taken that step aside to check it out. Laos is full of ethnic tribe villages and trekking, even down South. I actually found the village people much more welcoming in the southern parts in ethnic and remote villages than in the north (but that is my own opinion). This woman was doing great business at the morning market, selling the bright yellow flowers, Choy Sum, also known as Chinese Broccoli. They’re used in many meals in South East Asia, especially in Lao baguettes. The Bolaven Plateau is really worth checking out, and now afterwards I wish I would have taken even more time to see it. There are some great waterfall, and some really nice quiet villages along the Mekong river, as well as many fascinating minority villages where the people live a very different lifestyle and traditions which will blow your mind. We visited a village known for smoking these gigantic bamboo water pipes (even the kids). So before continuing down to 4000 islands, stop over in Pakse and do some day tours around the area. Another way to see the Bolaven Plateau is to hire a scooter for a day (or more, you might just want to stay the night in one of the villages – there are many guest houses around), so you can go at your own pace. If you’re keen to see Bolaven Plateau, a great way to do it is to simply base yourself in Pakse and make day trips around the Plateau. To me there was something sad about this picture and the man’s facial expression. Sabaidy 2 is the most popular place, so in high season don’t expect there to be any rooms available (it’s always worth a look though). Rooms cost between 40 000 and 80 000 kip (5 and 10 dollars), and is one of the few guesthouses with WiFi. Don’t panic if they are full, because there is a great guest house just around the corner from there called Phonesavanh Guesthouse (not the Hotel! ), where the rooms and bathrooms are clean and nice. Rooms cost between 40 000 and 55 000 kip. Whenever we walked past our neighbors on Don Det, Laos – this pig of theirs was always – always, eating. At Phonesavanh Guesthouse there is no WiFi unfortunately (not many hotels and guesthouses seemed to have WiFi), but there is a cafe only 3 minutes away that has high speed Wifi and an internet cafe a minute away. It’s called Katuad Cafe and is situated in the NE corner of Rt13 and 24th street. The food isn’t very impressive, neither is the service (the girls were acting as though they were tipsy! ), but they don’t complain if you just order a drink and sit there for the next 3-4 hours using the free wi-fi. There is a great local eatery on the corner of Thanon 21 and 24, which is cheaper than the similar ones on the main road and serve better food. For Indian/Malay food Nazim restaurant served amazing Indian food (cooked by an Indian chef). Jasmine restaurant is on the first glance very similar, with same dishes at similar prices. But they didn’t taste no way near as good in my opinion, and don’t visit their toilet before eating or you risk losing your appetite. For Lao food, visit the Lankham Noodle House below the Lankham Hotel, it’s cheap and they serve traditional Lao food – it’s very popular both with locals and backpackers. Chewing on bits of cut sugar cane is like a healthy chewing gum – as long as you spit it out once the juice is gone! You can book a tour privately with a mini van driver, but chances are it will turn out more expensive as you then need to pay for for the entrance fees, and won’t get a guide on the tour. 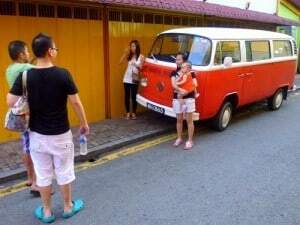 You can also book tours via your guesthouse, but there are also a few travel agencies around town. One is Pakse Travel & Air Service Office, which are a reliable agency with good drivers and guides. So take your time, experience the real Laos, before moving on either up north to the capital of Laos – Vientiane or down to the chill on Don Det in the 4000 islands. most people try not to get stuck here, but for different reasons, many people pass through and stay for a night or two. Fortunately, it’s quite a nice place to find yourself in. So whether you come by to wait for a visa to process, or just to rest your bum from bumpy bus rides before heading out on the road again, here is a short guide on how to spend that day and things to do in Vientiane. The golden temple is Laos most important national symbol, both for Lao authority and Buddhism. It’s a beautiful temple to visit, especially in the afternoon when the sun makes it even more golden. It’s 4km out of the city (northeast), so you can either walk (! ), bike or take a share tuk tuk to get there. Once it has cooled down outside, head over to the new fancy park “Chao Anouvong Park” by the riverside and hang out under the shade reading a book or playing cards. The park is brand new and really nice, they’re just finishing up the final touches. It’s a very attractive place to chill for a bit, there are some street stalls along the path and ice cream shops on the other side of the street. If you come in the morning or in the evening when the weather is a little cooler, you can have a try at the work out machines they provide in the park for free. It was one of our favorite things to do in Vientiane when we traveled by. This looked just like “Sweeny Todd’s” own Barber shop in Vang Vieng. A way to escape the midday heat is to do some shopping in the Talat Sao shopping mall. It’s not the biggest, or the cheapest, but good enough for a bit of shopping and a stroll around the place – besides, if you’ve been out all day it’s a good place to cool down. 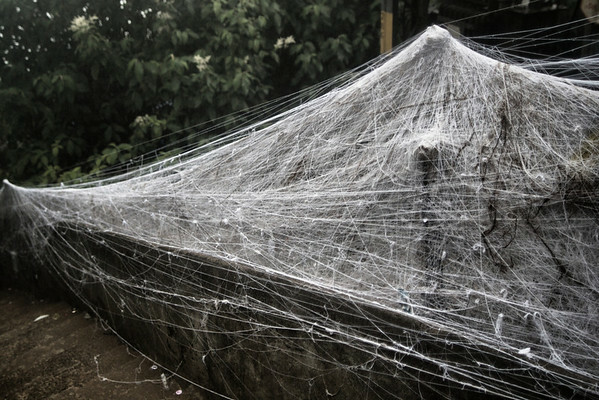 Everything in South East Asia is similar to the west, just a little more…graphic. I like it, it makes you see what you actually buy. Grab some dinner at Taj Mahal restaurant, they have the best Indian in town and at some really good prices. Definitely worth the walk. You’ll find it at Namphu area, right behind the cultural hall. Nazim is another Indian restaurant located by the river, they make nice meals, nothing like Taj Mahal but still a nice place if you want to sit close to the river. Full Moon Cafe and The Shade are two other restaurants at Francois Nginn Rd for those who want something closer to the central areas. Another place I just have to mention is the Scandinavian Bakery. Scandinavian pastries and cookies are some of the tastiest things ever, and this place make as good ones as any place in Scandinavia. In general there are a lot of bakeries around Vientiane, both Lao style and Western style. In the evening, hang out at one of the few bars along the riverside, or have a fruit shake or ice coffee at the awesome Aroma Café. It has some great coffee and shakes, and is one of the few places that offer free high speed WiFi, if you feel a need to get connected. You’ll find it on Francois Nginn Rd, it’s the cafe of the hotel Lotus. If you’re as crazy about fruit shakes as us, head over to rue Samsenthai and visit House of Fruit Shakes; the drinks are blended to perfection and only cost 6000 kip (0.7$)! There aren’t a huge amount of choices if you want to stay close to the riverside, but there are definitely a few worth checking out. Francois Nginn Rd has quite a few guest houses. I can recommend Youth Inn 2 (further down the street from the original one), which has clean rooms, private bathroom for an ok price (60 000 kip/7$). It’s one of the very few places that has free WiFi, although it’s a slow one. Hopefully this will help you enjoy all the things to do in Vientiane. If you plan to stay longer, I suggest you do a little cafe run and check out all of the amazing bakeries and coffee shops in the city! note: The photos and videos we took really showed the craziness of it all, but since we lost everything we can’t show you. These photos are not our own, but still give you an idea of what it was like, although the crowds of tourists seem to have more than doubled since they were taken! After the bumpiest 8 hour bus ride of my life from Luang Nam Tha – we finally arrived in Luang Prabang, Laos. The dusty ride had been awful, yet one of the most amazing ones I’ve experienced. We drove through the most scenic nature of Laos, passing countless of ethnic villages and tribes along the way, stopping on and off in a few. Women were showering from a bamboo pipe collecting water from the forest, and 5 year old kids were taught how to chop the grass for their roofs with machete knives – it was a pretty crazy sight. We had spent a few days in northern Laos – Luang Nam Tha to be exact – biking through these ethnic villages and had gotten a good glimpse of what Laos was about. We were, however, looking forward to visit the tourist hub of Luang Prabang. We had heard of the ‘incredible’ morning alms, and were keen to see what all the fuss was about. We had decided not to take part in the ceremony but to see it from a distance. The morning alms is not meant to be a tourist attraction, and since we’re not Buddhists we felt it was strange to take part. It turns out, nobody else felt that way. From where we stood there was a 50 meter long carpet laid out for people from where they would hand over some sticky rice to the passing monks. The whole 50 meters was packed with one big tourist group, all provided with a basket of rice by their guide, taking photos of each other half an hour before the monks even arrived. This was just the beginning. If this is where things ended, fine. But once it got light, and the 200 monks appeared, people went crazy. The many precautions one had been told about the morning alms such as no camera flashes, no walking in front of the monks, women sit down etc – was all forgotten. The monks were not treated like rock stars, but more like a passing tourist attraction, something very inhuman. There was a huge crowd surrounding the monks, running after them, trying to get that close up of their faces. Next to the monks were kids running along carrying big cardboard boxes, picking up the leftovers that the monks didn’t want, begging for some rice.. I must say, the monks didn’t look like they were enjoying their ceremony – at all! They were all very young, and it was almost as though they were running to get away. What surprised me was that there really wasn’t anything special about these alms; they do the same thing all across Laos, but in smaller groups. It was worth a look just to see how bananas the tourists got, but I must admit, it’s easy to get sucked in. I’m not completely innocent, I was there and therefore part of the problem. The next morning we were up at 5 o clock again to catch a bus down to Vang Vieng. Walking down a small side street in the pitch dark, we suddenly saw a long line of bright orange robes coming towards us. Along the street were quite a few locals waiting for them with their baskets of rice. These monks were much older than the ones from the previous day and walked in a nice slow pace, taking time for each local to give them their alms. This was a whole different group, up earlier before the tourist, taking complete different route… not a single flash camera around, we stood enjoying the tradition before moving on. Want To See The Morning Alms In Peace? The morning alms is something special to witness, and I would definitely recommend seeing one, but not taking part in it, and perhaps not the one in Luang Prabang. Luang Prabang is not the only place, they do the morning alms every day all over Laos. After our up and down trip through Laos – we headed down to Cambodia and to the capital of Phnom Penh. Cambodia has had a really dark and painful recent history, so while in Phnom Penh we decided to visit Tuol Sleng Genocide Museum. Tuol Sleng was a former high school which was used as the notorious Security Prison 21 (S-21) by the Khmer Rouge communist regime from its rise to power in 1975 to its fall in 1979. After the sadness and pain of what we witnessed at Toul Sleng in Phnom Penh, we were excited to head up to Siem Reap and explore one of the biggest and amazing temple areas in the world – the famous Angkor Wat. Nothing apart from visiting Angkor Wat can really give it justice – the crowds, all the temples, the amazing sunset which we experienced alone … it was a really amazing, and tiring day. Our visit to Cambodia was an interesting experience. I never really managed to get a grip of the country, I was confused, to say the least. Sometimes I didn’t like it at all, other times I felt like I could easily settle down there for a longer time. Cambodia was to me a country full of contradictions, and although I was happy to leave I would like to return again some time to see more. In the end, these are the travel experiences that I treasure the most. The country made me love it and hate it at the same time. These feelings are hard to write down or to explain to others, and often I can’t quite point out exactly what made me feel so great or bad about a place. Really, it’s not a pajama-looking outfit, they actually are real pajamas with teddy bears and everything. They wear it as casual outfits, and not just at home but sometimes even at work on the street. When they dress up, they wear the most amazing outfits. There was a wedding in a village we stayed, and for some reason most of the men seemed to stay at home or at the shop while their wifes went to the wedding – they looked absolutely stunning. Thick, juicy fried spiders in broth? This is no joke, no tourism stall for eager people to try disgusting things – this is real. Deep fried tarantulas is a common snack all over Cambodia on the streets in small villages and markets in Phnom Pehn. I’ve never seen plain baguettes without any topping being so commonly consumed and enjoyed as much as here. I was surprised to see how many people spoke English so well, some even spoke with an Australian or American accent! 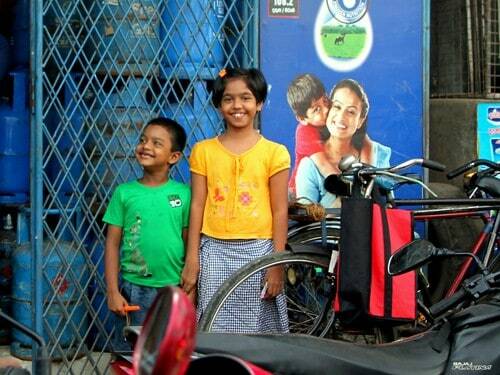 Kids, tuk tuk drivers and random people, they all spoke English really well in the cities. Nathan was wearing broken glasses (better than nothing when it’s that sunny) on a bus from Laos to Cambodia, and no-one noticed until we crossed over into Cambodia, then a few 20-something guys on the bus noticed and thought it was SO funny – they couldn’t stop looking, and laughed for like 15 mins! This was one of many situations in which we found Cambodians laughing at things we in the West wouldn’t at all consider funny – it was as though they had the same humor as an 8 year old – which I think was so great to see. That freedom to just let go, be curious and laugh at anything was one of the best things about the Cambodian people, and it’s something which I think is lacking in the West. I didn’t realize how little I knew about Cambodia until I got here. I thought I knew more than I did, and seeing how the country has far from recovered from the horrific recent history was difficult to deal with. The people have been betrayed from so many different sides, both from their own people as well as others. The impact from the land mines was sad to witness, and so was Tuol Sleng. Despite all the terrible things done to these people, they still put up such a bright face. They smile and laugh often, but the ways they dealt with confrontation made me wonder. While we were there the Thailand/Cambodia border started shooting at each other and people were killed on both sides. Our tuk tuk driver told us the same night, in a very strange way. He laughed about it, nervously, so we had to ask him if he was telling us the truth – he was serious for a moment, but then he smiled and laughed again. I wanted to ask more, but it was obvious that he didn’t want to talk about it. Why wouldn’t you want to go help out in a country that will welcome you with a glass of ruou ran (rice wine with a pickled snake inside) and where potbelly pigs are considered pets? There’s also a god dedicated to the kitchen and a lot of motorbikes to hop onto, if that first couple of facts didn’t grab your attention. On top of the above (and a lot of cashews and coffee beans), there’s plenty of chances to experience this slice of Asian paradise as you make a positive difference. From education to infrastructure, Vietnam is a prime candidate for hard work and easy relaxation. We’re not sure if the “S” shape of Vietnam stands for Super, Spellbinding, or Sensational, but any pick is a good guess. Social development is a particularly active field, with the disabled needing most of your attention. The aftermath of Agent Orange’s mental and physical destruction are still seen daily, and there are plenty of options to get involved. The country’s rapid social growth and increase of Street Kids also leads to a need of volunteers in orphanages and classrooms, where a friend is even better than a teacher. With low wages and without a free education system, your participation in a community school project will offer a future to children that otherwise wouldn’t have the chance to leave the house with a backpack every morning. Life Lessons from Climbing Adam’s Peak In Sri Lanka – Earlier this year we traveled to Sri Lanka, a country full of beauty and adventure. 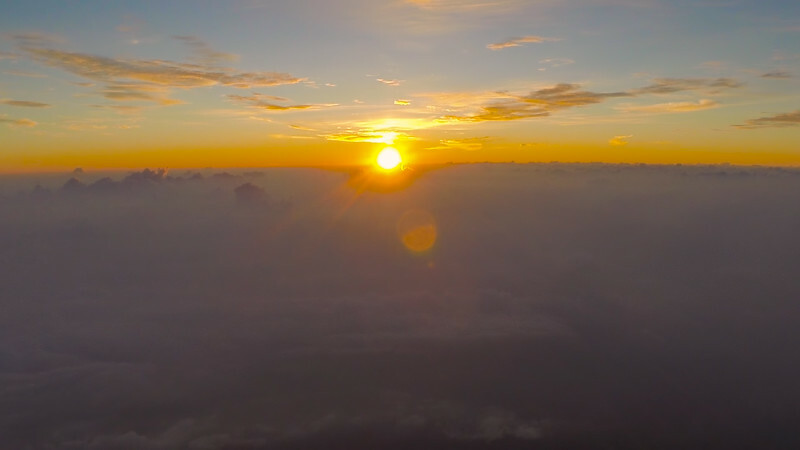 We had heard about the beautiful view of the sunrise from the top of a sacred mountain called Adam’s Peak – and decided to join thousands of pilgrims on their pilgrimage to the peak. Being a holy place for both Buddhists, Hindus, Muslims and Christians, Adam’s Peak is very unique. To be at the top when the sun rose, you had to begin the hike at 2am. The rain was pouring down during the entire 4 hour climb up to the peak, small waterfalls had been created in the rocks next to the steps, and you had to wade through deep large mud pools in darkness. Just our luck – we had managed to pick the most miserable night of the year to climb Adam’s Peak, but we were far from the only ones. We ended up bringing home much more than just wet clothes, as we learned a few useful life lessons from the journey. Whenever you were at your lowest, with wet hair and clothes sticking to your skin. Someone would start chanting, almost as though they could feel your struggle. The chanting spread like a fire among the climbers who all joined in, singing the same lyrics over and over. I have no idea what they said, but it was beautiful and it reminded me of everyone else who were with me going through the same struggles, and looking around me realizing what a crazy thing I was doing made me enjoy the process. I will try my best to apply this to other aspects of my life, and whenever things get tough, look around and see the beauty of it and remember that things aren’t so bad after all. We all had a different purpose for climbing that mountain, and for me it became about completing something, about not giving in, and showing myself that I could do it. 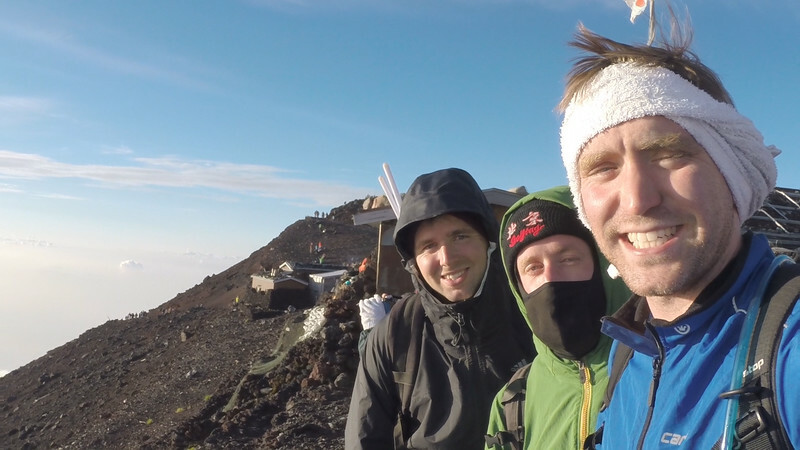 When we finally reached the top, I was wet, cold, exhausted – and happy – the view was nice, but it was the feeling of accomplishment that really meant something more. Next time I’m in doubt, I will think of how great it felt to be proud over exceeding my own expectations. While I’m not a hiker at all, I can tell you that Adam’s Peak is not an easy climb. I would have thought it impossible for a one-legged person to climb it, if I hadn’t seen it with my own eyes. In the end, it all comes down to your mind. If your mind is strong enough, you can accomplish things well beyond what others would say is impossible. The mind will give up before the body does. If I would have been alone climbing for 4 hours at night in the worst possible rainstorm, I would have given up before I even began. But being surrounded by thousands of people, from 4 year old children to 90 year old women and men with bent backs climbing the mountain in their bare feet, gave me the strength and inspiration to carry on. If you do it together, you can bring each other up. On the way down from the mountain, our legs were shaking from the stress endured during the climb. The pain was almost unbearable, but you had to get down and there was only one way to go. “Getting to the summit is optional, getting down is mandatory” – Ed Viesturs. It’s the same thing with life, we often reach points where we simply have no choice to just stop but have to finish what we started. Sri Lanka’s hill country is unbelievably beautiful, with lush green forest, abundant wild life, tea plantations and countless waterfalls. Exploring the hill country of Sri Lanka is a must when visiting the country, and here are some of the best places to start with. Kandy is the cultural and spiritual capital of Sri Lanka, with some of the country’s most important temples like the Temple of the Tooth, a nice lake, and a bustling local market. There are lots of restaurants and bakeries in Kandy that are worth exploring, and some great hotels (many of them are perched on top of hills with incredible views), making this city a good base for excursions to the cultural triangle. The only thing we didn’t like about Kandy was how many people try to hustle you to visit their shops, all with identical routines – so be on your guard! Ella is a tiny little village in a large, stunning area which is easy to explore on your own. Go for a morning walk up to what is locally nicknamed as “Little Adam’s Peak” for the beautiful views, then check out the tea plantation which you walk through on the way back down, visit a waterfall or take a longer hike up to Ella Rock. Ella is all about the views and being close to nature. Everywhere you go in the hill country of Sri Lanka, you’ll see jungles, hills, and tea plantations. While in Malaysia you have to seek them out, here you simply stumble upon these beautiful velvet-looking fields. When you’re back in the little village again, make sure you try the buffalo curd with treacle at the Curd Shop. Favorite snack in the hill-country region. Nuwara Eliya is a strange place, there is no other way to describe it. With typical British climate and British architecture to top it off, you feel like either you or the town is out of place. The city center is a boring concrete block, but the outskirts have houses and buildings that are almost more British than Britain itself. The buildings all give the impression of a glamorous past, one which has faded. And while time has passed and the world has changed, life in and around these buildings are still stuck in the 1920’s England. Embrace it, have your tea on the porch or in the garden, and then explore the tea plantations surrounding the area. Pedro’s Tea Estate is close and cheap to get to (800 rupee/6 dollars both ways and the driver will wait for as long a you need). You can pay for a tour around the Sri Lanka tea factory if you like, but walking among the cordial-looking hills of tea plants is definitely the highlight. The plantation has some beautiful views overlooking the lake, and you can watch the workers skillfully picking tea leaves from the bush. 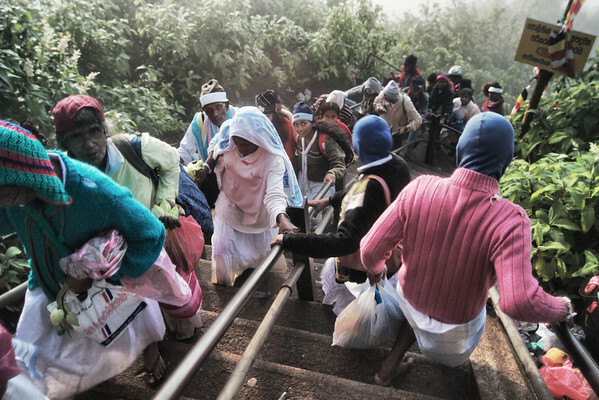 To climb Adam’s Peak, the most famous pilgrimage site in Sri Lanka. The 9 kilometers long climb up the steps to the top of the hill is not easy, especially not in heavy rain. Which we had to climb in, or at 3 am in the morning. So make sure you bring good shoes, energy, and clothes to fit the weather (it’s freezing at the top)! Many people are intrigued to climb the peak to see the amazing sunrise and views from the top, but what is really the most incredible and mind blowing part of the journey is the climb, together with thousands of pilgrims of all ages, struggling to the top. It’s a sacred site for Buddhists, Christians, Muslims and Hindus, which makes it a very special place. The area surrounding Dalhousie is very beautiful, with at least a dozen of powerful waterfalls, lush tea plantations and an old stone church on the road from Hatton which is worth checking out. Budget Friendly Travel Hacks For Visiting Sri Lanka is a beautiful place to visit with its lush hill districts, fascinating temples and delicious food. But compared to other nearby countries like India, Sri Lanka can seem quite expensive. The one thing you will be sure to find dirt cheap in Sri Lanka is food. But you have to go to the right places. When you see a hole in the wall restaurant with dirty walls and long tables packed with locals, it’s often a great place to get cheap but tasty food and favorite Sri Lanka drinks. We found street markets and small restaurants (who didn’t have menus) to give gigantic servings, so a good advice is to order one plate to share. Another thing worth noting is that when ordering curry meals, you will also get free rice refills. Vegetarian meals are the cheapest options, fish and seafood is slightly more expensive and chicken costs a bit more. The transport will either end up being the most expensive or the cheapest part of your trip. For us, it turned out to be the most expensive – trains are dirt cheap (because they’re government run), but on holidays you need to have booked your tickets weeks in advance, or it will be completely booked up or a ride from hell. Buses are also cheap but are the most uncomfortable ways of travel – chances are you will have to stand up for 8 hours bumping into someone else’s armpit, as drivers cram the buses full of people and then hurtle around at ferocious speeds, slamming on the brakes. 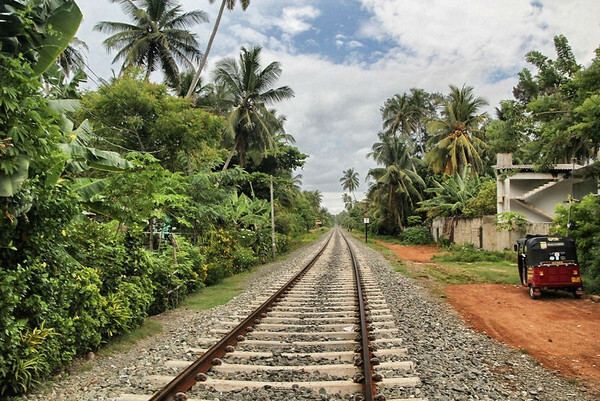 So whenever possible, book train tickets in advance and travel outside of holidays, because they are very busy in Sri Lanka. The train rides are beautiful, so taking the Observation car is definitely recommended. Prices for guest house rooms will be higher closer to tourist beaches, but generally you should be able to stay in a double room for less than £20, or you can grab a bed in a dorm for £3-10 a night. If you don’t need A/C or wifi, you can get by pretty cheap. 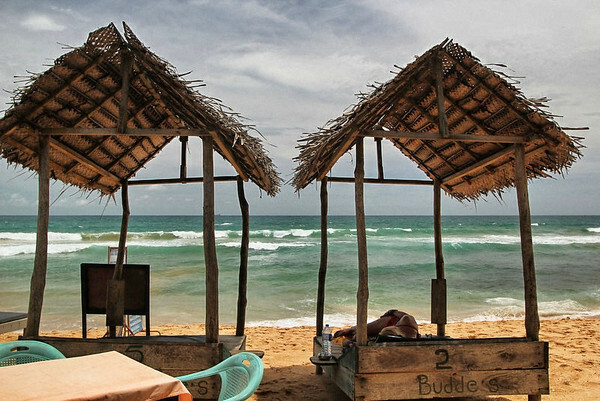 Package deals to Sri Lanka have become more popular and often work out cheaper than arranging a do-it-yourself holiday. You can get luxury rooms for reasonable prices, especially if you book last minute or in the wet season. 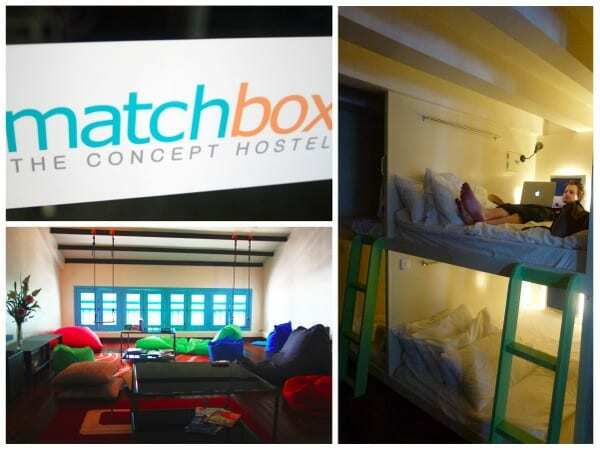 If you’re looking to really save your budget, couchsurfing could allow you to stay in the country for free. Traveling by car is by far the most comfortable way of travel, and one way to get a great deal is to hire a driver for a week. We didn’t know this before, and ended up hiring new drivers for every journey, which turned out to cost a lot more than if we would have stuck with the first driver (who btw turned out to be the most honest). If you find a driver in the beginning of your trip, it’s definitely worth getting an international call plan in advance so that you can book him for the whole trip and stay in touch on pick-up and drop-off times. Some even arrange the driver before they arrive in Sri Lanka. This is a good idea if you don’t want to have to worry about tracking down phone-cards, the Vonage UK website offers ways to make cheap calls to Sri Lanka, and to keep in touch without receiving an excessive phone bill. Another massive drain on your budget will be the touristy temples and national parks. 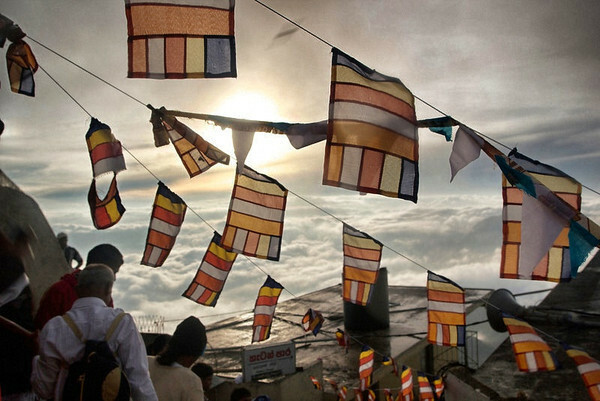 The majority of Sri Lanka’s most impressive sights charge hefty admission fees. Save money by avoiding the crowds and trying out some of the wonderful free things the country has to offer. 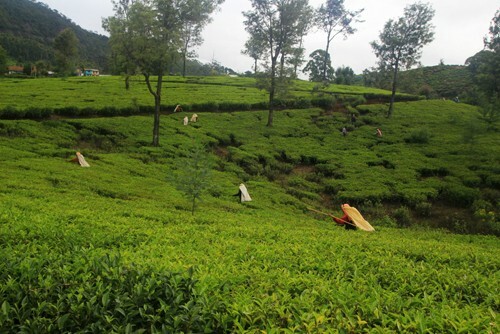 One of the things Sri Lanka is most famous for is its tea production. Many of the plantations in the hill district will offer free tours. Lipton’s Seat – the seat is one of the highest lookout points in Sri Lanka, allowing you stunning views over the hill country. 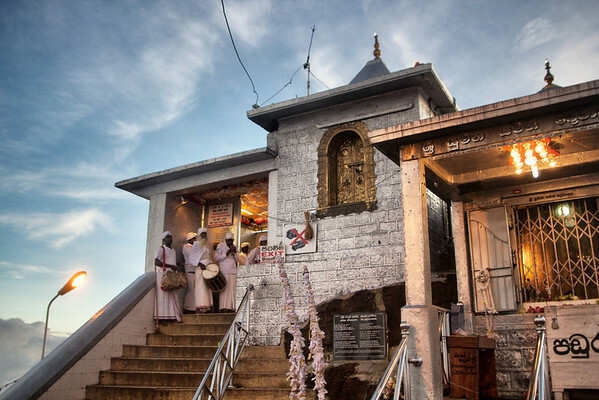 To experience religious culture without paying exorbitant prices, check out some of the free temples in Kandy. Just across the lake from the pricey Temple of the Tooth Relic is a sprawling monastery with an interesting museum. The monks are happy to give you a free tour and to explain the origins of all the artefacts. There’s also a vibrant Hindu temple in the centre of town which visitors are welcome to enter. Inside are colourful wall murals and charming images of Hindu Gods. There are many free temples and sites to explore on a budget. One crazy cultural experience is to climb Adam’s Peak at 2am in the morning. A boutique hotel catering for people looking for pure relaxation and an amazing view. We were exhausted after climbing Adam’s Peak the day before, so Theva Residency was exactly what we needed. A place to relax and rejuvenate, leaving all our troubles behind and just enjoy. The hotel clings to the hillside, blending in with the surrounding nature, almost as though it was part of it. the view from the spacious windows was spectacular. The city, the nature, the surrounding hill tops and a temple with a huge white sitting buddha on top of a hill, could all be seen from our bedroom. It was the kind of view that makes you feel like you own the world. The food served in the restaurant was superb, with an interesting choice of dishes. Having a big sweet tooth, the desserts on the menu seemed too good to resist, so I decided for a selection of home made ice creams to have as a pre-course. The breakfast was delicious and very filling, with a range of cakes and pastries, home made jams, a variety of egg dishes, and a scrumptious fruit salad. The perfect way to start the next day. The hotel is situated on Hantana mountain, and while it feels like you’re a world away from Kandy, it’s only about 2 km to the city center, making it a wonderful place to be based. There are 10 rooms in Theva Residency, and we stayed in the Suite on the top floor. Our room was spacious and bright, with large panoramic windows, and its very own jacuzzi hot tub. All the rooms at Theva have high-speed WiFi, TV and DVD player (with loads of movies to watch) and are designed using natural materials like wood, stone, pure cotton and linen. After some time in the hotel’s sauna or sunbathing on the deck, you can cool off in the infinity pool with the most amazing views. We would definitely recommend this place for your next stay in Kandy – the unbeatable views, and the wonderful hospitality of the staff made for a memorable visit to Kandy. Sri Lanka’s coast line is among some of the most beautiful we’ve seen, and we really wish we could have stayed there much longer. There are many amazing beaches south of Colombo. With spice gardens and turtle sanctuaries to visit along the way. There are so many places to visit in Sri Lanka that it would take you months to see everything, despite the small size of the country. The general vibe of the beach towns is very relaxed and laid back, making you feel like there is not a worry in the world. In other words, a perfect vacation destination. Hikkaduwa is a laid back beach town with a lively main road and a beautiful long beach lined with guesthouses and restaurants. It was one of our favorite places to visit in Sri Lanka for both good swimming as well as nice restaurants. During high season it’s a good beach for beginners who would like to try surfing, while in the off season the waves get quite big, making it a popular place for professional surfers. There are parts of the beaches where you can swim in calm waters and even go snorkeling (and swim with turtles!) in the reef. 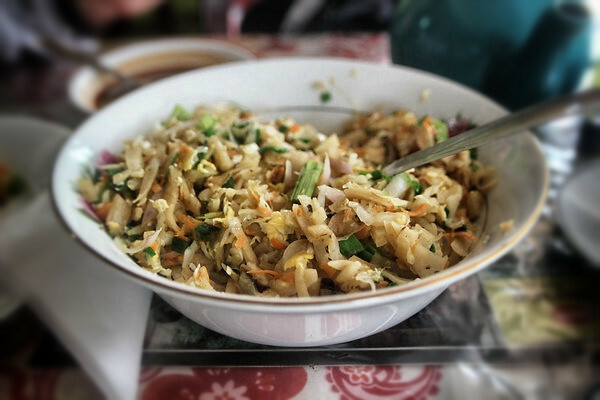 We spent our days in Hikkauwa surfing, swimming and getting acquainted with all the different Sri Lankan food – and before we knew it almost a week had gone past! There is a quiet calm over the streets in Galle Fort. Locals half sitting, half lying down in chairs under ceiling fans, children playing cricket on the porches. There is not a sign of stress anywhere to be seen. We joined the rest of the locals in the little area, and sat for hours in cafes with a pot of tea, talking to our table neighbors and the waiter, feeling no need to leave any time soon. A light ocean breeze sweeps through the streets every now and then, making it possible to explore the town without fainting from the heat. Old colonial European-style houses line the streets, painted in bright colors with Hibiscus flowers hanging over the walls and from the balconies of the long and narrow buildings. In the old days you had to pay tax on the width of your home, which resulted in people building narrow homes and instead extending in length – these houses remain to this day. Quaint little tea houses and art galleries are scattered around the town, next to gem boutiques and antique shops. 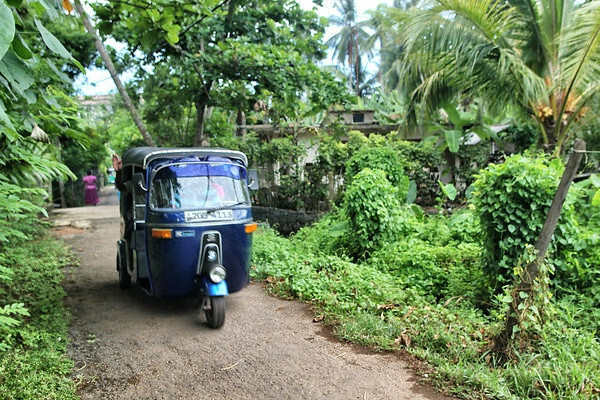 Galle is often included as one of the places to visit in Sri Lanka and is also a good base to explore the nearly beaches by bus or three-wheeler during the day. Unnawatuna is a more quiet beach town without the hectic main road of Hikkaduwa, where the water is calm and clear, and where your hotel is located quite literally in the water. This is one of those places to visit in Sri Lanka where you go for pure relaxation, with palm trees hanging over the waterfront providing a nice shade, and three-wheeler drivers waiting to take you on day excursions to turtle sanctuaries and spice gardens. Having breakfast at the beach with the waves touching your feet is a lovely way to start the day. How A Tsunami Evacuation Connected Us With The Locals. 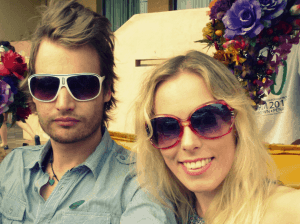 We had just arrived in the sleepy beach town of Hikkaduwa in Sri Lanka, and crashed on the bed exhausted after a long day of traveling from Colombo and taking one of the many cheap international flights from Germany. “Are you shaking the bed?” Nathan suddenly asked me. I wasn’t, but I could feel the whole ground slightly shaking under me. As I looked around the room I noticed that the mirrors were shaking too. Thousands of miles across the ocean, we could feel the vibrations from the massive earthquake which had just struck the coast of Indonesia. We didn’t think much more of it at the time, until one of the local travel agents asked Nathan if he had heard anything about a tsunami coming. At first we thought it was some kind of bad joke, but as we checked out Twitter Search, the newsfeed was going crazy. Nobody really knew what to think, believe or do. 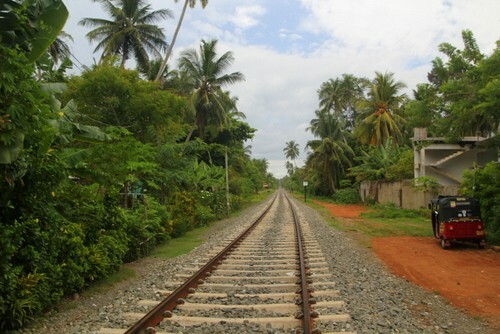 Hikkaduwa had been badly damaged from the tsunami in 2006, so this warning was not something people there took lightly. We had two options:to risk it and stay, or to evacuate and seek higher ground. Ten minutes later we had packed a small bag of the most necessary things, and walked out on the street. The laid back main street had suddenly turned into a ghost town, the shops were closed and the streets empty from people – most of the locals had already left. We didn’t want to waste any time, and so we simply looked on a map for a village that seemed far away enough in-land and told the driver to take us there. At first the driver laughed when we told him where we wanted to go, but then he suddenly got a serious look on his face and agreed to take us there for almost nothing, perhaps he had realized the danger and wanted to get out of there as well. Shortly after we left, the whole town was forced to evacuate. Once he had dropped us off we realized why he had laughed. We found ourselves in the middle of nowhere in a tiny country village which probably no tourists ever visited as there was no reason to go there. I’ve never been stared at so much in my life! We walked up and down the main road (the only road there), trying to find somewhere we could wait and follow the news. But there were no restaurants or hotels to be found anywhere. We finally found a tiny eatery with a small TV that was hardly working, and sat down to wait, we asked the boy serving us if there was a hotel around, but he shook his head apologetically. Five minutes later the boy from the restaurant caught up with us on his bicycle, and with a low and slightly shy voice said that if we wanted to we could stay the night with him and his family. It was only our second day in Sri Lanka, and already we were experiencing the kind-ness and hospitality that the Sri Lankan people are so famous for. The boy’s family took us in with open arms, arranged a bed for us to sleep in and made a huge effort to make us feel at home in their house, serving us a wonderful dinner in their lounge. In the evening, the tsunami warning was cancelled. But with the warm hospitality coming from this family we ended up staying the night and spent the rest of the evening hanging out with them. Talking about everything and nothing, watching movies and getting an amazing insight into the lives of the people of the country. Melaka – We had about a month left in Malaysia before our trip down to Singapore in June and needed to find a place where we could relax and work for a while. Melaka turned out to be the perfect place for this, and we ended up staying there for the whole month – with it becoming our favorite city in Malaysia! The people in Melaka are very relaxed and welcoming, and it didn’t take very long until many of them started recognizing us and treating us like locals. While the city is pretty close to the cosmopolitan capital Kuala Lumpur, Melaka has an entirely different vibe. Hurry was not a known word in this place, everybody took their time, and you could sit and do nothing at all, without feeling bad for it. The hands on the clock tower on the main square had stopped at half past two, but nobody seemed to have bothered to change it (or even noticed?) for a long time, perhaps because time is irrelevant there anyway. What I noticed about Malaysia in general was even more obvious in Melaka – this is the true land of smiles! In contrary to many countries, people in Malaysia smile just for the sake of smiling, nothing else. It is such a freeing feeling to know that the person smiling at you doesn’t want anything in return but a smile from you too. In many countries the only smiles you get are when someone wants something from you, most often your business. When they want to sell you something, they smile – if they don’t, they won’t bother. In Malaysia, people smile a lot, and they do it because they simply want to, especially in Melaka Malaysia. Because of Melaka’s interesting history, with Dutch, British and Portuguese settlers, there is a fun diversity there. You’ll find Dutch inspired houses, Portuguese inspired food, and shoes and traditions from the Nyonya people (Chinese-Malay). Sitting by one of the cafes lining the (Dutch) canal was one of my favorite things to do, although you could get quite tired having to always wave back at every tour boat and fishing boat that passed by on the canal. Yes, waving to each other was like an unwritten law there..! It is sometimes a little difficult to travel in Malaysia without anything pre-planned. Malaysians themselves love to travel in their own country, and with all the holidays they have hotels are fully booked very often. I was not surprised to find out that Malaysia has the most holidays in the whole world – it literally felt as though every second day was some sort of holiday! My experience with Malaysians is that they are very open-minded to other cultures and traditions. This became especially clear to me when a group of teenage girls came up to me one day in a mall for an interview for their school project. “You look so fashionable today!”, “I love your blonde hair!”, they said while touching my hair and smiling. Which is your favorite city in Malaysia? 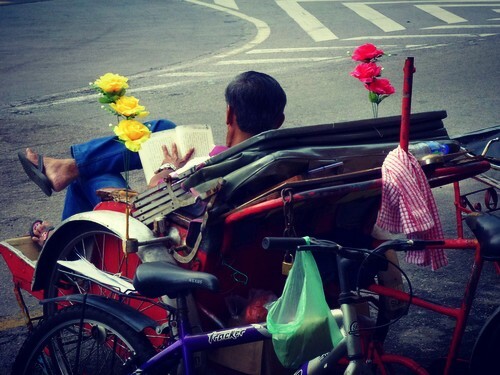 Kuala Lumpur, a city where everything is crazy in the most structured way you can imagine. hard to put a finger on what this city really is simply because it’s such a big mixture of everything. The city is similar to much of their food style – inspired from all countries in Asia thrown into one pot, so what do you do in Malaysia? 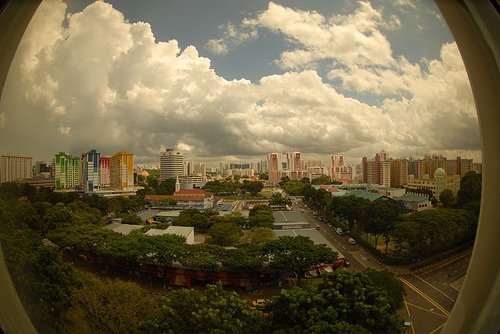 Kuala Lumpur has really focused on two big pleasures of life – Shopping and Food. You could probably spend a whole week in Kuala Lumpur never stepping your foot outside the malls. It often feels like as soon as you step out of the tram you step into another mall. 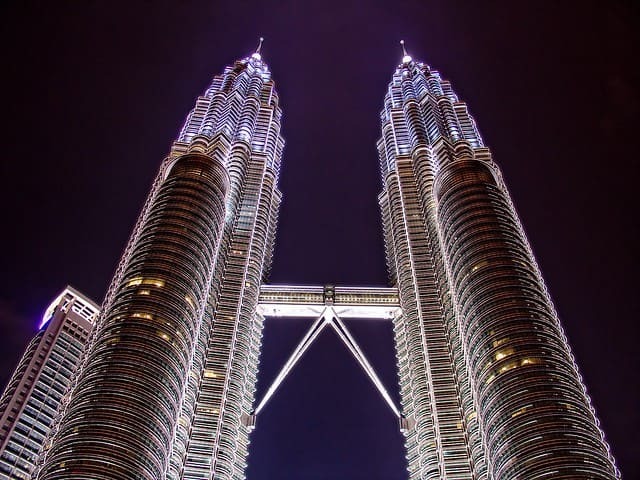 Start the morning by visiting the Petronas Towers, the second largest building in the world. It’s a beautiful building even on the outside, as is the shopping mall inside, Suria KLCC. If you want you can even take a walk on the sky bridge which is the highest bridge between any towers in the world. You can get free tickets if you get there first thing in the morning, the counter opens at 8am so be there then or at least 8.30. On your ticket it says what time you should be able to come back and allowed to walk on the tower, but you won’t be allowed to go up right after getting the ticket. There are normally massive crowds there on a daily basis! The shopping mall in the twin towers was just a preview for what is coming up. Kuala Lumpur has 66 shopping malls to spend your cash. Some of them are really beautiful inside and there are often happenings going on in the malls, all from fat-loss beauty competitions to the new exclusive watch shows. The shoes with the bag with the dress with the scarf etc. Not only did they match their outfits with each other, they matched it with the shopping mall they were going to! There is not a chance you will be able to visit all the shopping malls, but take a visit to Lot 10 (beautiful architecture inside), Sungei Wang Plaza, Bukit Bintang Plaza, Star Hill Gallery, KL Plaza, Pavilion and Berjaya times Square (HUGE). Shopping in the Golden triangle is easy as the shopping malls are so close to each other, you can walk out of a mall and into another in a matter of seconds. After some shopping you might want to sit down and rest your feet while having a nice lunch. Food is the most important thing for Malaysians, and thanks to the variety of cultures here, you will find the food choices are many. Jalan Alor, a street in the middle of the Golden Triangle has countless of food stalls and restaurants where you can choose whatever you like to eat. Visit the Independence square (Dataran Merdeka) where Malaysia’s independence was declared in 1957. Right in front of the impressive Sultan Abdul Samad building, and other historical buildings such as the old railway station and the St. Mary Cathedral which is over a hundred years old. It’s quite nice with the fountain and the flag poles lined up along the square. Have an authentic Malay dinner in Kampung Baru. 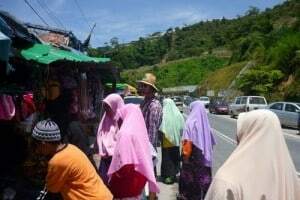 This area has a very authentic Malay feel to it, and since the area is trying to stand against the modern developments in the city they have preserved the traditional Malay style, and among traditional houses and clothing there is also a lot of typical Malay food to find here. Here you will get a good insight in the traditional Malay culture. Walk through China Town and bargain some fake copies or try the street food. Do some shopping along the night market in Jalan Petaling. Here the shopping is completely different from what you experienced in the fancy shopping mall earlier this morning. What’s amazing isn’t the stuff they sell, but the contradiction and the sudden changes in the city, which you can also find while walking through Indian Town. Unless your feet are tired from the busy day, you can go and enjoy the busy night life in Jalan Bukit Bintang, a street full of pubs, clubs, open air cafes, street performances etc. Everything you need for a good night out! Kit Kat, produced by Nestlé, is a company responsible for the diminishing forest and soon to be extinct Orangutans in Borneo, Malaysia. They destroy the native forest, make it impossible for the native animals and tribe people to survive in the new desert of only Palm Oil trees. Admiring the most iconic building in Kuala Lumpur – the Petronas Towers, while at the same time floating on your back in an infinity pool, just doesn’t make any sense – it simply would be too good to be true. While searching for an apartment in Kuala Lumpur, we managed to find an unbelievable place to stay, right opposite the famous Twin Towers in the middle of the city. Two large pools (one literally with a view of the Petronas Towers), a tennis court, fully equipped gym, sauna, reading room with free wifi, mini mart, laundry and a cafe. Booking online with Roomorama went really smoothly: you find a place you want, send an inquiry to the host, and if it’s available, the host will get back to you and offer you the place. If it is unavailable, or if you simply want to make it easier for yourself, you can use the “Shout Out” feature. Where you add the city you’ll be visiting, the dates, number of guests, and write a short message. This message will be sent off to all the hosts in the city you’ll be visiting, who can then get back to you with their offers. Sometimes you meet the host before moving in, but often the host arranges everything so that this isn’t necessary. We picked up the keys from the concierge at the reception, and once we had moved into the studio apartment, we sent the host a “payment code” so that she could collect the money. It is a very safe system, preventing hosts from taking the money before the guests have checked in and made sure that everything is fine. Our experience with Roomorama was great as always, and anyone looking for apartments with that extra flair and a great location should look into using Roomorama for their next trip. 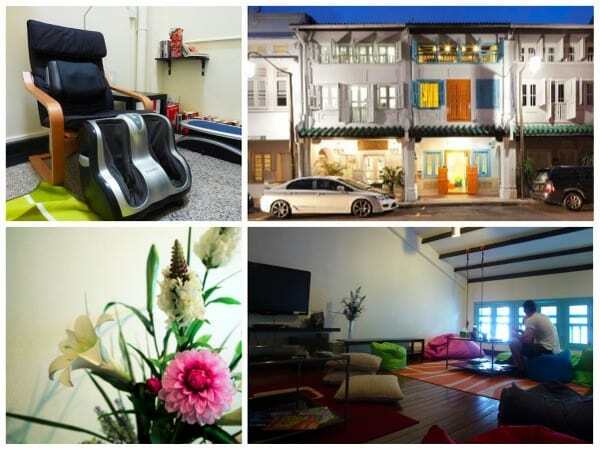 Centrally located in the heart of Kuala Lumpur, you’ll find The Nest Guesthouse, one of the top rated B&B’s in the city. Owners have truly understood what it takes to make their guests feel comfortable and enjoy their stay. “One of the most important things about a good guesthouse, is the vibe” says Lupo, one of the owners. When you enter the guesthouse you immediately leave the busy, chaotic streets of KL behind and feel right at home. The lounge has a nice vibe with comfy couches where you can watch movies, read magazines, and meet other travelers. The bedrooms are bright and spacious, and the common kitchen with free tea/coffee and breakfast, is immaculately clean. Cleanliness, the modern designs, and the attention to small details – such as the aromatherapy shower gel in the bathrooms and the super fast high-speed wifi throughout the building. For those who don’t have laptops there are two computers in the lounge you can use for free. The location is great, tucked away on a smaller street in a neighborhood with heaps of great restaurants, bars, shopping malls and street markets nearby. It’s a great guesthouse at a good price, in a location close to almost everything, and we would definitely stay at the Nest Guesthouse again next time we visit KL. Meanwhile, in Kuala Lumpur, Malaysia, things didn’t seem to have changed that much. It had been two years since we were there last time, so after spending some time in Southern Thailand we decided to head down to Malaysia to see what had changed. 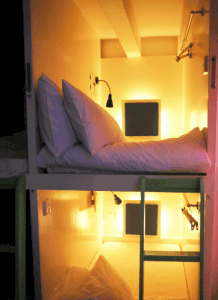 We went to the same hostel we had stayed at last time, and everything was still the same. We went to India street, and found the same restaurants which looked the same as last time. 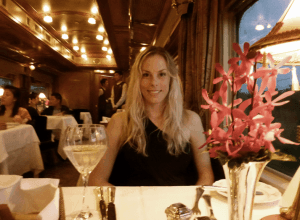 After a couple of days enjoying the best of Singapore, we had the pleasure of traveling on the Eastern and Oriental Express up to Bangkok – the train took us through the jungles of Malaysia and rice fields of Thailand during 3 luxurious and unforgettable days. Since Woodland’s train station is slightly out of town, we checked in for the train at the Regent Hotel, a five star hotel on Orchard Road with the same luxurious, traditional style of the Eastern and Oriental Express train. The air was filled with excitement, and looking around the room there were all sorts of people who were taking the journey: solo travelers, couples, friends and families. When boarding the Eastern and Oriental Express, your steward takes you to your “room” – there are 3 types of compartments: Pullman Cabins (bunk beds), State Cabins (twin beds) and Presidential Suites. They’re all very well appointed and beautifully designed with walls of cherry wood and romantic decorations in Oriental style. We stayed in a Pullman Cabin, which was slightly small but well laid out – each cabin has a bathroom with shower, a writing desk, panoramic windows and a couch that is converted into beds by the steward when you’re out for dinner. The observation car was one of the highlights on the Eastern and Oriental Express, and one of the first things we decided to check out. When there is no window separating you from the rice fields, jungles and rural countryside, it feels more real: you can smell the country – hear it – feel it. The view from the train was exactly like in the movies, where children play by the tracks and farmers look up and waive their hands with a big smile as you pass. The saloon car, library car, restaurant cars and piano bar car really made you feel like you had stepped back into a glamorous past. There was a traditional luxury over the whole train, both in the design as much as in the service and general vibe. Chit-chatting over a tray of peanuts and a glass of wine while listening to beautiful piano music was a reality I never thought possible on a train – everything was immaculate and so full of character and charm. 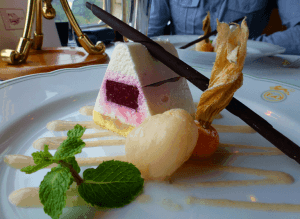 We felt truly spoiled with the exceptional food we indulged in during the trip on Eastern and Oriental Express. A lot of thought and skill were put into every single dish, from the unique mixture of Asian and European influences to the presentation – I have no idea how the chefs managed to make such great food in such tiny kitchens on a bumpy train! Breakfast is served in the cabin on a big tray with everything from Danish pastries to local Malaysian tea. Lunch is served in one of the restaurant cars, and we were surprised to find that even this was a full 4 course meal! Afternoon tea was served in the cabin, with a nice selection of local treats to try. We really liked how they used a lot of local Asian ingredients and specialties – the local cuisine is a big part of experiencing a country, and on the Eastern and Oriental Express you really got a taste of South East Asia. I don’t think I’ve ever eaten so much food in the span of three short days..! The dinner on the Eastern and Oriental Express is quite an event, where suit jacket and tie is compulsory for men, and women dress up in evening dresses. In the romantic dining cars you’re served a 5-course meal every evening, with some absolutely delicious desserts and chocolates to finish the night in perfection. With fruit tasting, palm reading, foot massage and a Thai dance show, there are many things to keep you busy on the Eastern and Oriental Express, and on both days of the journey you take a small excursion. In Malaysia you go for a guided Trishaw tour around Georgetown, Penang, and in Thailand you visit the Bridge on the River Kwai for a boat tour and a museum visit. 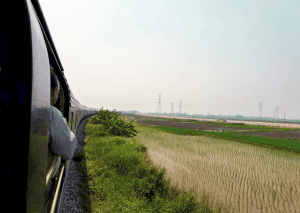 These are great ways to take in the culture of the places you visit, but it’s the journey and the Eastern and Oriental Express in itself that is the real experience. 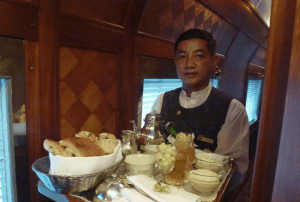 While the Eastern and Oriental Express truly knows how to provide a glamorous vibe and luxurious experience, what made the journey most memorable, were the exceptional staff. They treated it like something more than just a job, they were really enjoying it – and it showed through. They were professional and yet personal, making us feel very pampered and special. The staff makes all the difference, and the people working for this company were what made the journey the best it could possibly be – this trip was something very special for everyone onboard the train, and the staff treated it as though it was special also for them. Our journey with the Eastern and Oriental Express was exactly what people say it is: a journey like no other! Earlier this year we had the opportunity to travel on the Eastern and Oriental Express from Singapore to Bangkok. The 3-day trip was one of pure indulgence with good food, beautiful views and 5-star service! Our days in Malaysia have mostly consisted of an identical pattern: eating, working, walking, eating, working, walking – in other words, just what we had planned to do. Malaysia is unlike any other country, more multi-cultural than you can imagine, and the people are incredibly friendly – it was the perfect place to settle down for a couple of weeks to work and relax. Our next stop is Singapore, a place we’ve never been to before and are really excited to explore. BUT the bigger news is that next Tuesday (after spending a week in Singapore), we’ll be embarking on a train journey in what is perhaps the most romantic, and definitely the most luxurious way to see South East Asia – with the Eastern & Oriental Express. This epic train journey will take us through the dense rain forests, wide open orchards and remote towns with the comfort and luxury of a five star hotel. 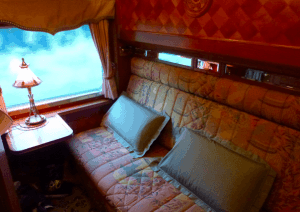 It will be a three day trip from Singapore to Bangkok, with daily excursions along the way. “It’s all about the journey, not the destination”. This is the ideal train journey for travelers who enjoy the comfort of luxury resorts, but want to explore more of the country they visit than just sitting by the beach. The Eastern & Oriental Express route was created in 1992 by the same people who operate the Simplon Orient Express. They bought the Japanese made coaches that served the Auckland – Wellington route in 1972-1979. The exterior is the same, but internally the coaches have been completely rebuilt inside to top luxury standards, with en suite sleeping compartments, two dining cars, piano bar car, observation car, observation car lounge and a saloon & reading room car. The different Orient Express trains that have been operating around the world for centuries awake mythical tales and stories of murder and mystery, spies such as exotic ‘artiste’ Mata Hari and Robert Baden Powell, a French president who “fell off the train”, and more. Novels like Agatha Christie’s “Murder on the Orient Express” have shaped this idea of exotic mystery, and while some of these tales are probably less true than others, we look forward to find out what stories await us on our own journey. While we will be offline during our trip, we’ll tell you all about it when we get back to “real life” again on arrival in Bangkok. The best way to describe what the Eastern & Oriental Express was really like is to simply show you – after all, don’t they say a picture is worth a thousand words. Below we have put together a photo essay to showcase the best of our train trip (you will even see us dressed to the max in a suit & evening dress :P) – also if you would like to read more about the train and our personal journey. 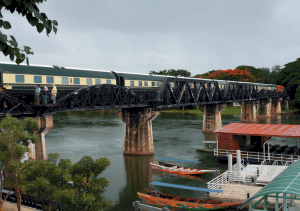 The observation car was one of our favorite things about the E&O – located at the very end of the train, you could enjoy the landscape sweeping past, slowly changing as you traveled from the south in Singapore all the way up north to Bangkok. Those getting up early to watch the sunrise through the mist were served hot tea, which added a nice touch to the colonial ambiance of the car. Our conversations during lunch were always interrupted by one of us going “hey – look at that!” pointing out the window, seeing something odd, funny or amazing. Like Agatha Christie says: Trains are wonderful… to travel by train is to see nature and human beings, towns… and rivers, in fact, to see life. This journey was all about relaxing, indulging and enjoying yourself. After all the extra hassle that comes with planning your own travels, it was really nice to have a break and just sit back and relax letting the exceptional and friendly staff take care of everything for you, from the excursions to the wonderful food. When darkness fell outside the window, the train got even brighter and livelier inside – men dressed up in tuxedos and a tie, women putting on their evening dresses and glimmering jewels, and the piano bar full of people mingling after dinner with a glass of wine or two. And finally, the food – those who know me are well aware that I have a SERIOUS sweet tooth, so as you can see I was very spoiled with all the beautiful desserts and sweets served on the train. Impressions Of Sri Lanka – What You Need To Know! Impressions Of Sri Lanka – After spending three weeks in Sri Lanka, we left the country with many new impressions and experiences. Sri Lanka had given us so many contrasting experiences, and the charismatic people we had met along the way had given us different insights into the country and its people. It was interesting to see how this country has quickly risen from a long time of struggling and hardship, and is today really starting to take shape and create its own identity. I really enjoyed the people in Sri Lanka, and can honestly say that they were among the friendliest people I’ve met. We often felt that the people we met were genuinely interested in us, and were happy to share a lot about themselves as well. Children or adults, they were all easy to talk to and everyone always said hello, waiving from the car or street. Being invited to a Sri Lankan family’s home was a great example of their openness and hospitality, but that wasn’t the only time we experienced this; on the buses and trains, on the streets and in hotels, the people were incredibly friendly and often greeted us with big smiles as soon as you made eye contact. Many Sri Lankans were very positive about the future, something which you could tell not only in conversations but everywhere around you. For example, hotels seemed to be built in a way where they could easily add new floors once business was prospering. The portions in Sri Lanka are massive – sometimes when we ordered two meals, the waiter would tell us that one would be enough for both of us (some pretty honest people! ), which turned out to be very true. We were expecting the food to be similar to that of India, but found that the Sri Lankan cuisine had a very distinct style of its own. If you ever travel to Sri Lanka, you have to try their street food! There are Roti (a type of pancake) in an endless variety, lots of pastries, and the very popular buffalo curd, which you will love or hate. Sri Lankans also seem incredibly fond of their foul smelling “Wood Apple”, which surprisingly tastes delicious as a milkshake. From postcard-perfect beaches with palm trees hanging over the waterfront of a milky turquoise ocean and colorful wooden fishing boats, to lush rain forest, countless of waterfalls and tea plantations. Sri Lanka has some of the most beautiful and diverse nature I’ve ever seen. There is a little bit of everything for everyone when it comes to the nature in Sri Lanka, surfers and beach bums will love the beaches, hikers will love the mountains and views, and adventurous people will love the wild life and how easy it is to find “unexplored” and “off the beaten path” areas. You can see a lot of it from the train window, but getting up close with the nature there is a very unique experience! We were actually very surprised, and confused, about the cost of things in Sri Lanka. Compared to other countries in South and South East Asia, Sri Lanka is not cheap – you simply get less for what you pay for. Public transport was insanely cheap, but also incredibly difficult to use. Trains often only went twice a day, and at the time we were there they were so overcrowded that even the ticket salesmen often advised us to take a taxi. To see many of the places and attractions in an area you often need a driver, so hiring one for a week or the entire duration of your stay is actually a really good idea – but naturally, this will also cost you more. The fees to temples and cultural sites, were often surprisingly high, which put us off a little since we weren’t prepared for that. So, as a conclusion, Sri Lanka offers a lot to see and do, but to really be able to do it all and get the very most of the country when it comes to attractions, bring a bigger budget than to India and SEA. Earlier this year we spent 3 weeks traveling around Sri Lanka, a country with incredible diverse nature and the most charming people. Sri Lanka is so full of surprises and experiences, there are so many things to see and do there that we didn’t feel that 3 weeks was enough. Here is a video we made of our our 3 week trip: in under 4 minutes on video – enjoy! We knew that D-Day (Day of Decision Making) would come sooner or later, but like always we kept avoiding it by having “more important things to think about”. Which led to us being just as late in our planning as always. Somehow we always manage to leave these things to the very last minute. In 3 weeks we’ll have to pack our bags and leave Germany…but to where? When doing some brainstorming the other day, the idea of going to Sri Lanka came up. The thing I didn’t like about the beaches in Thailand was that the water was absolutely still, something which got very boring after some time. Sri Lanka has the best of both worlds; paradise beaches and good surfing. Unawatuna has been voted as one of the top 10 most beautiful beaches in the world by Discovery Channel, and people take Sri Lanka holidays to surf at Arugam Bay, one of the top 10 surf destinations in the world. Often one of the main reasons I travel to a country is because of the food. Being a vegetarian it might seem odd that I’m such a food fanatic, but for some reason it has had the opposite effect on me and has made me even more fascinated about food. Sri Lanka is heaven when it comes to vegetarian food, which makes it another great reason to visit. It is also one of the largest exporters of tea in the world. In other words, perfect for tea lovers like me, besides, few things are more beautiful than the sight of rolling hills with tea plantations that look like velvet. One of the best ways to get an insight into a country’s tradition and culture is to attend the festivals and celebrations, and there are so many festivals in Sri Lanka that it seems like the people there love to find reasons to celebrate..! One of the biggest celebrations is the annual Perahera festival in Kandy, a Buddhist celebration with elephant parades and dances – something I would love to see! I’m quite cautious when it comes to elephant centers, as I know that many of them mistreat their animals, and it’s sometimes difficult to know as a visitor. In Sri Lanka, the Asian Elephants were hunted close to extinction during the British colonial period, and are now endangered. But the country has made many efforts to increase the elephant population, promoting eco tourism and has as many as nine national parks, seven bird sanctuaries and several conservation centers like Pinnawela Elephant Orphanage. It seems like a good place to meet these huge gentle animals without feeling guilty. To read more about our time in Sri Lanka, check out the articles. One of the main attractions of island life is the tropical climes. Unlike many holiday destinations, there is no bad time to visit which is great for those looking for a winter break. 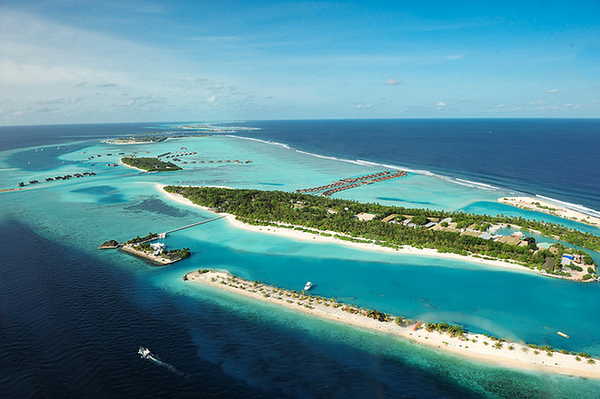 With an average temperature of 32 degrees all year round, the Maldives guarantees great weather for holidaymakers. If you are looking for a luxurious holiday destination, the Maldives should be at the very top of your list – turquoise blue waters and white sandy beaches provide a stunning setting for long walks on the beach, beautiful sunsets and romantic diners by the sea. If you long to get away from the hustle and bustle of city life, Maldives is where you will find your own slice of island life. If you wish you can create your own romantic cocoon and secure your place on an all inclusive resort. If it’s a romantic holiday you are looking for, the Maldives ticks all of the boxes and if it’s romance you are looking for you will find it in abundance. 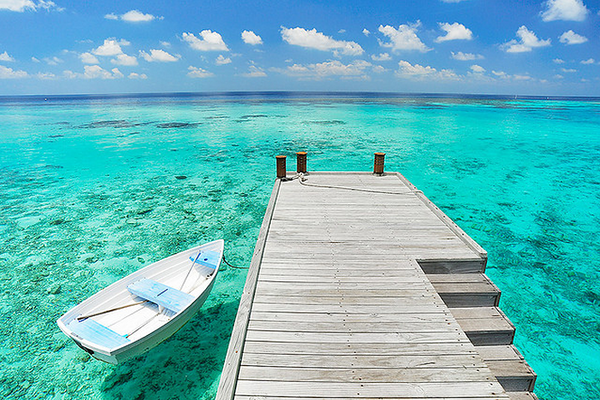 The Maldives has more to offer than beautiful blue beaches and stunning scenery. If you want to get active during your stay, the coral reef is one of the main attractions. You can go scuba diving and experience what the clear waters have to offer. You can visit all of the top scuba diving spots on the island or take to the seas for a spot of whale watching. Everyone needs a little me time and there is no better place for a spot of pampering than the Maldives. As soon as you step off the plane, you can feel the stresses of everyday life disappear as you get to grips with island life. 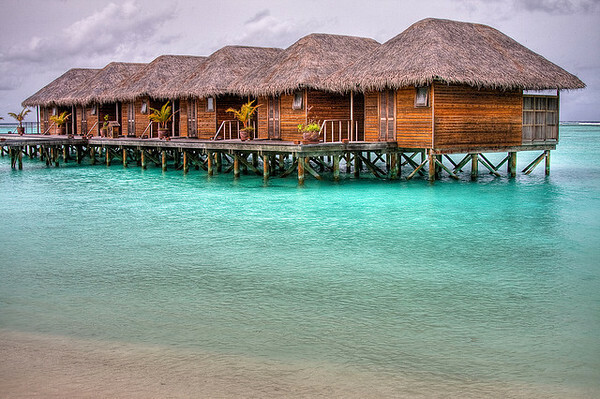 If you want to relax and unwind, the Maldives has a lot to offer those who want to de-stress. Almost all of the exclusive resorts on the island boast beautiful spa facilities and an impressive menu of spa treatments. With bungalows perched on stilts above a sea as clear as bathwater, and with countless, uncrowded beaches, the Maldives are the ultimate destination for island luxury. It’s difficult to visit the Maldives on a budget, but very few places can compete with the comfort and extravagance provided by a Maldives resort. Almost every Maldives resort has a spa, and these spas incorporate traditional remedies from the Ayurvedic tradition as well as sand massages and coconut oil treatments. Given the incredible beauty and remoteness of the natural surroundings, receiving a treatment here after a day of snorkeling and swimming may be quite possibly the most relaxing thing on earth. Stressed out travelers planning their next holiday probably can’t do better to heal what ails them. For those who really want to get away from it all, it’s possible to visit an uninhabited island and claim it for a day. As only 200 of the islands are inhabited, that leaves more than 800 unoccupied islands to explore. 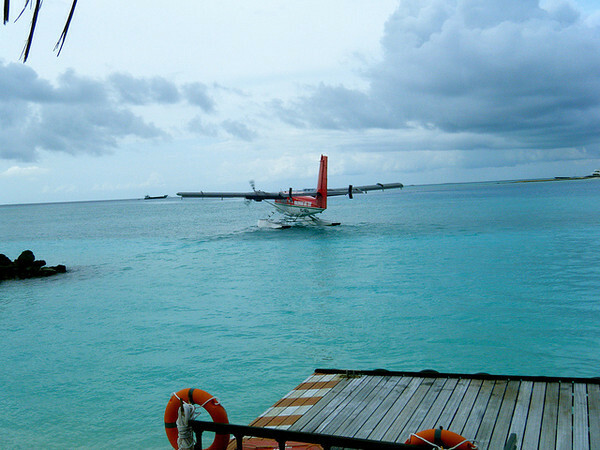 Travel there by boat and learn about traditional fishing, or take an air taxi. Safari boats allow visitors to tour multiple islands whereas it’s possible to arrange an overnight stay with a dhoni boat. With all the resorts and tourists, it’s easy to overlook local life and customs. Remedy that with a trip to the capital city of Malé. Shop in the markets, admire the brightly-painted buildings and mosques, and take advantage of one of the only inexpensive pleasures of the Maldives: the street food! Enjoy rich, spicy curries, the freshest of fish, and any number of deep-fried snacks. Visitors should note that while drinking laws are relaxed for the resorts, drinking alcohol is not permitted in the capital. The National Museum is small but gives visitors a sense of the islands’ history, and is housed in the only remaining building of what was once a Sultan’s opulent palace. If you are willing to travel a little further afield and spend a bit more cash, the Maldives is the summer holiday retreat for you. Just 200 of the 1000 plus islands are inhabited but that doesn’t stop the visitors pouring in every year to benefit from the gorgeous weather and great range of activities on offer. The Maldives are perfect from diving and snorkeling as the clear water coupled with amazing coral islands to dive around give you plenty to explore, whilst the beautiful white, sandy beaches are the ideal place to rest up for the day and top up your tan if water sport isn’t your thing. This amazingly beautiful island nation must be paradise on earth, and looking at the pictures I can see why so many people go there for their honeymoon. The white beaches, the great diving and snorkeling, the relaxed atmosphere.. it just seems like a place where you can really sit back and relax for a while. 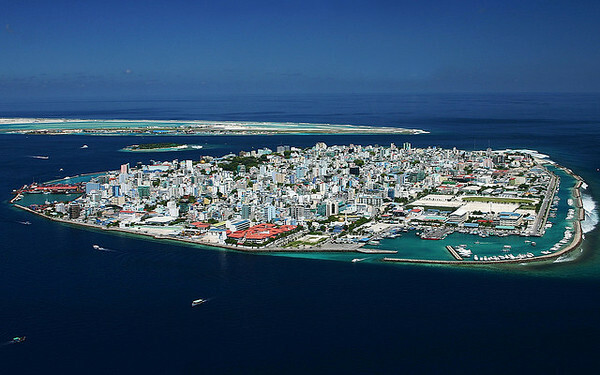 But not for too long, Maldives is sinking, and scientists fear the sea level is rising up to 0.9cm a year. Since 80% of its 1,200 islands are no more than 1m above sea level, within 100 years the Maldives could become completely uninhabitable. Visiting the place is probably the last thing you should worry about, but I have to say that I would like to see it before it’s all under water.